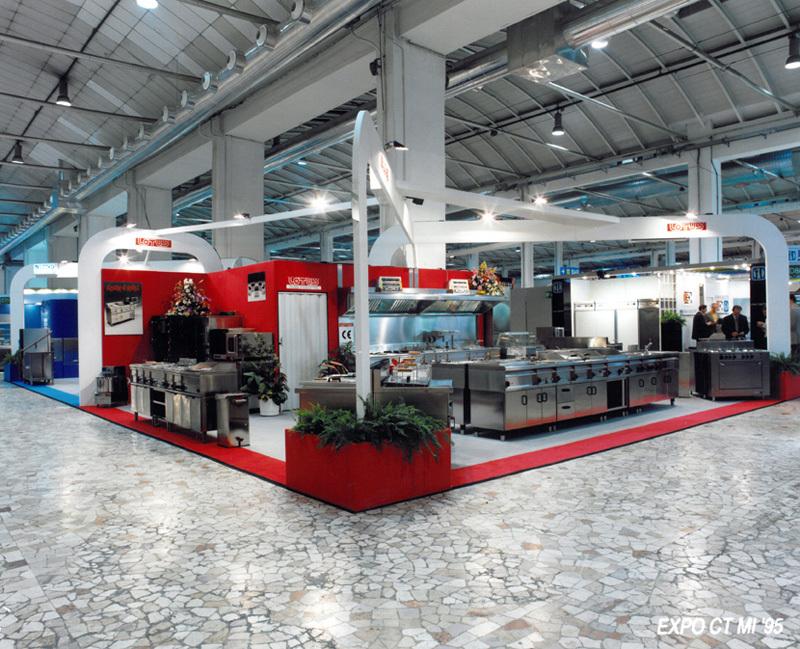 IPERLOTUS 90+90 "TOTAL BLACK LOOK"
that nowadays spreads over 14000 square metres and covers 8000 square metres! 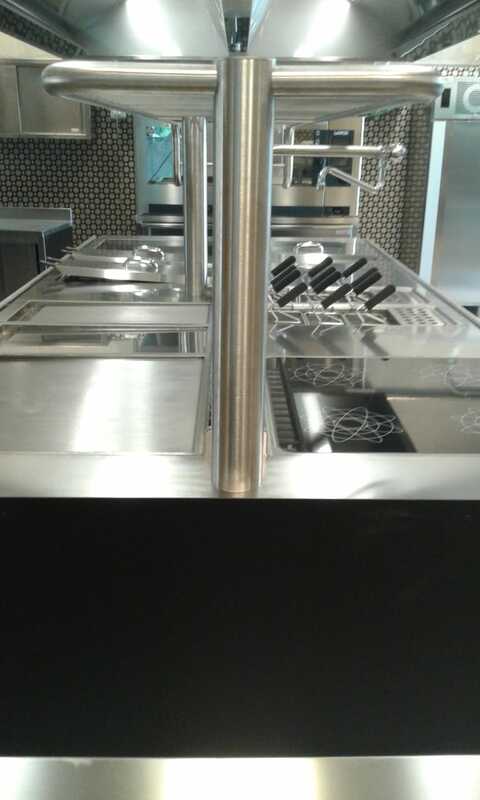 High profile in the kitchen! 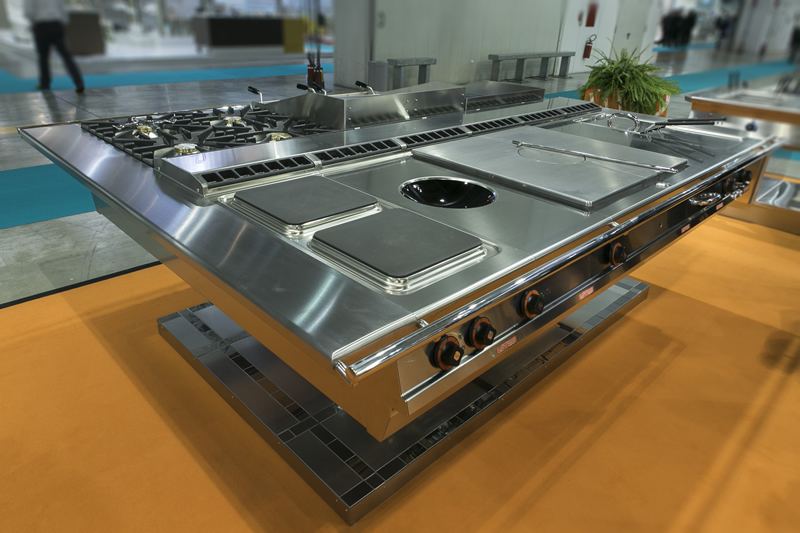 FreeBlock: the Lotus cooking monoblock! 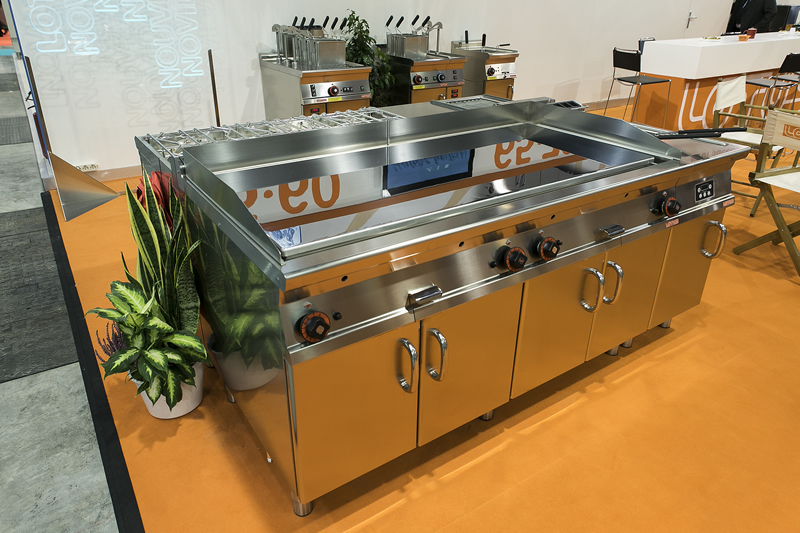 For small and large numbers, for the typical cramped kitchen of the historic centers and large kitchens organized large-scale, Lotus spa can count on two great strengths: the articulation, designed for every range keeping in mind the different compatible dimensions and the design, for range of models that can be perfectly integrated and coordinated with each other whilst maintaining the harmony and the functionality/performance of the service. 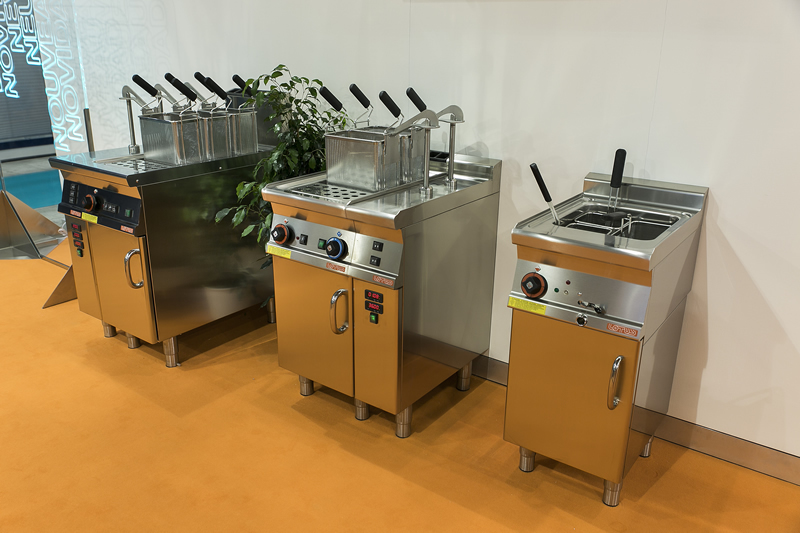 With the 6 base depth available - 50/55/60/65/70/90 - LOTUS spa combines an infinite variety of solutions and allows to create new original depth at any time: 110/120/130/140/150/180. 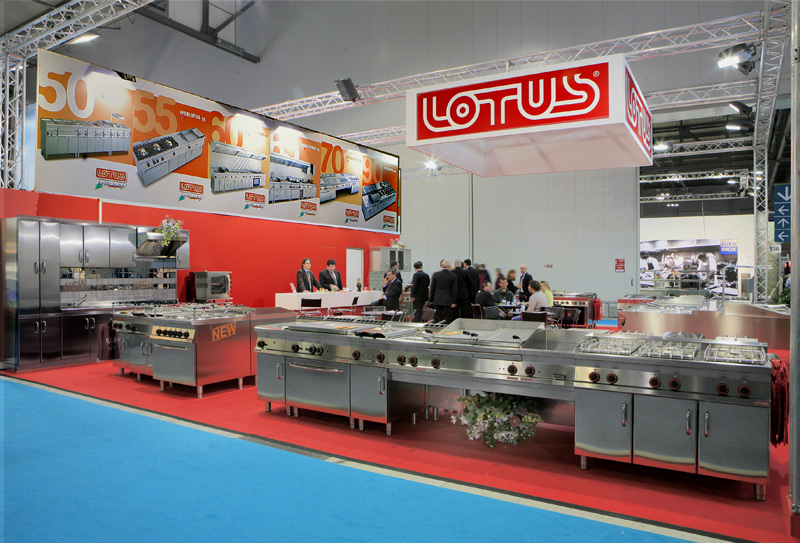 Lotus offers everything you need for standard in-line, wall, cantilever, bridge or island and eventually particular built-in solutions: FreeLotus and FreeBlock. 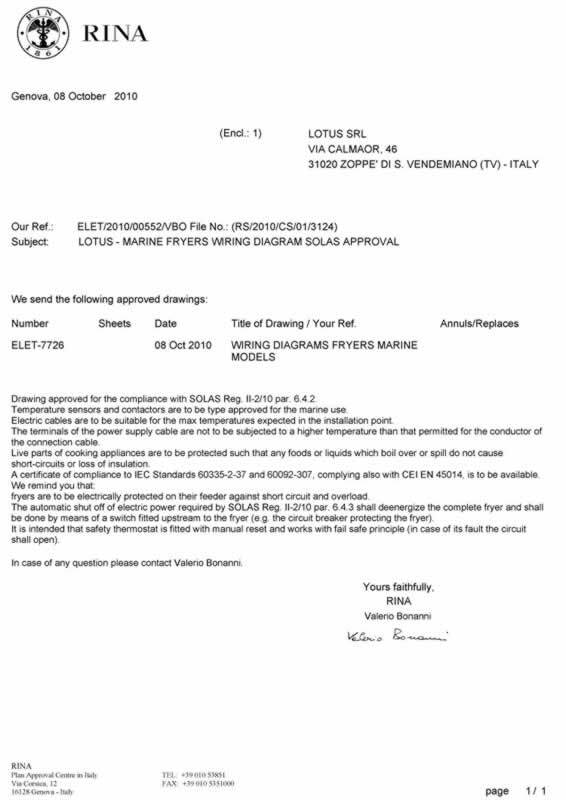 Last but not least, Lotus offers specific solutions for the nautical world with the assurance of reliability, performance and attractive appearance. 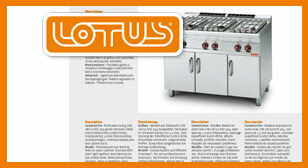 LOTUS spa designs and verify dimensions, measures, different powers, new or additional equipment, such as salamanders, grills, lava rock, ceramic floors, pans, as well as technological innovations such as the induction, the wok, the sousvide/vacuum cooking and the softcooker which improve the functionality of a kitchen and respond flexibly to new needs of traditional, multi-ethnic and international levels. 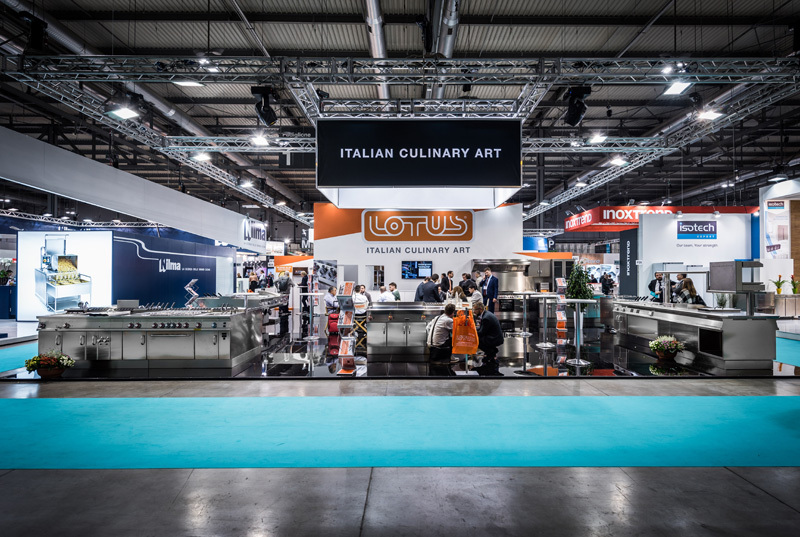 Modularity and easy compatibility, security and freedom of assembly, availability of accessories to support, are the requirements of the wide range of distinctive lines and models LOTUS spa, style is unmistakably "made in Italy" which guarantees to work in an environment more pleasant, efficient and efficient. 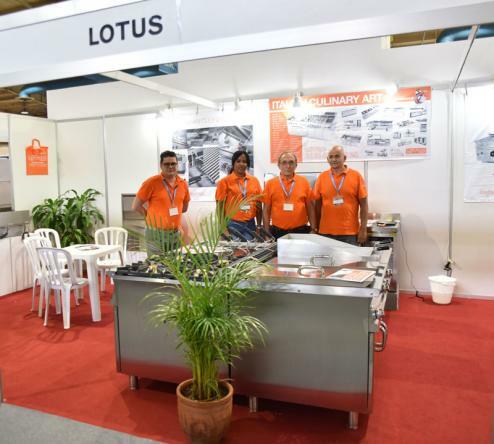 LOTUS, which started out in 1985 as an artisans enterprise, had what it took to build and consolidate its business following efficient and well organised industrial lines, perfecting its internal organisation and obtaining ISO 9002 certification as early as 1996 and ISO 9001 immediately after, in 1998. 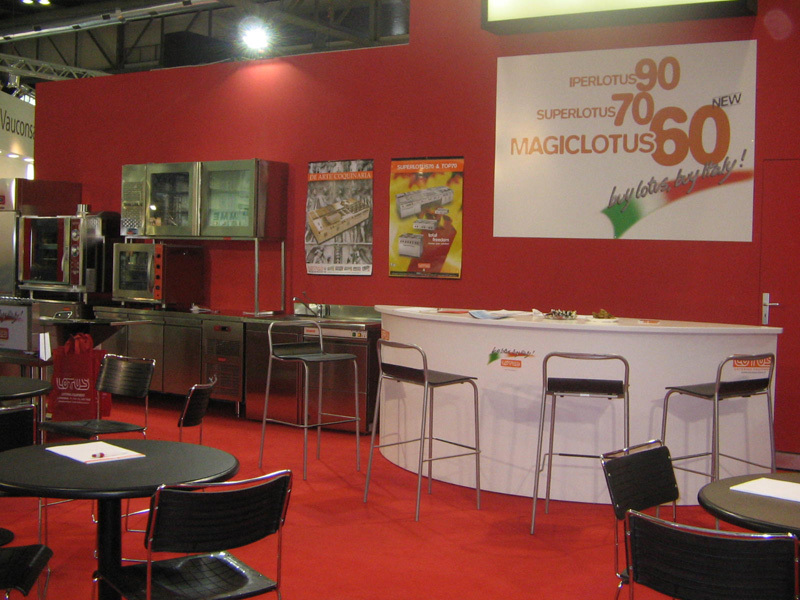 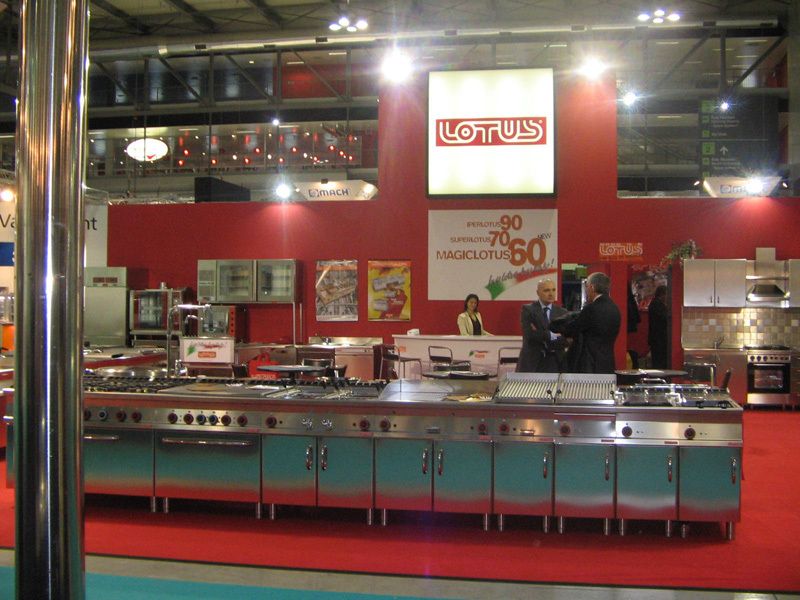 This growth and development also affected the products: from a company specialising exclusively in the manufacturing of snack equipment, LOTUS went on to successfully manufacture other product lines: from the professional lines ‘70’ and ‘90’ up to the new cooking systems, which can meet and address the different needs. 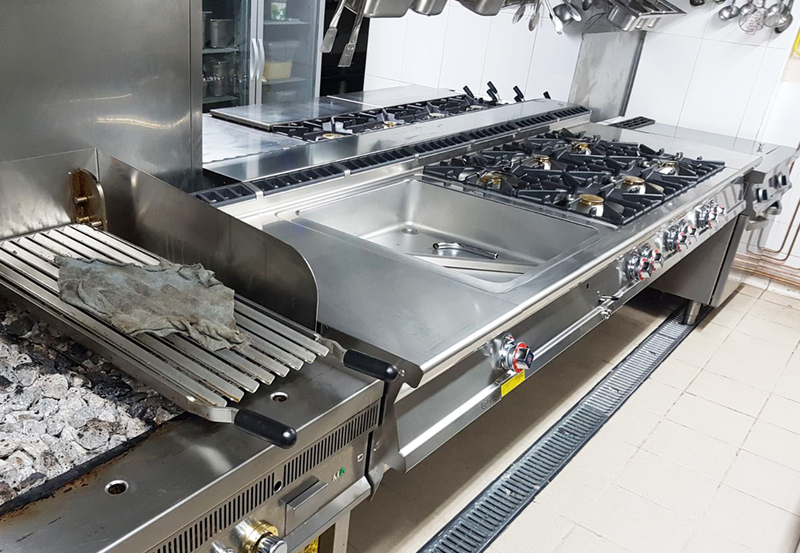 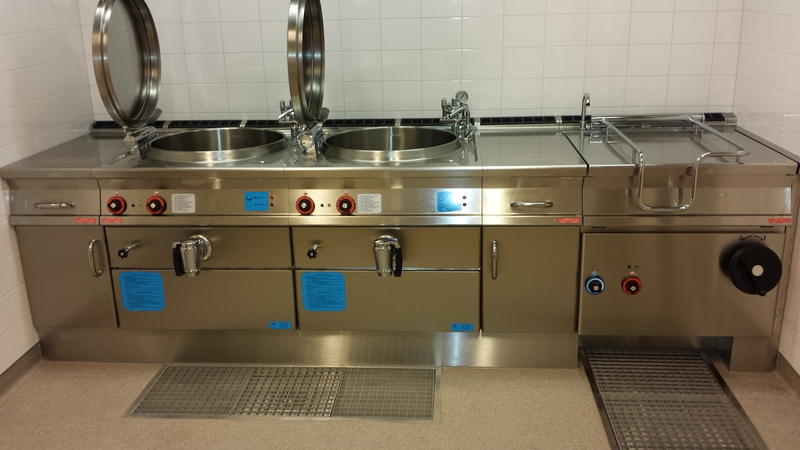 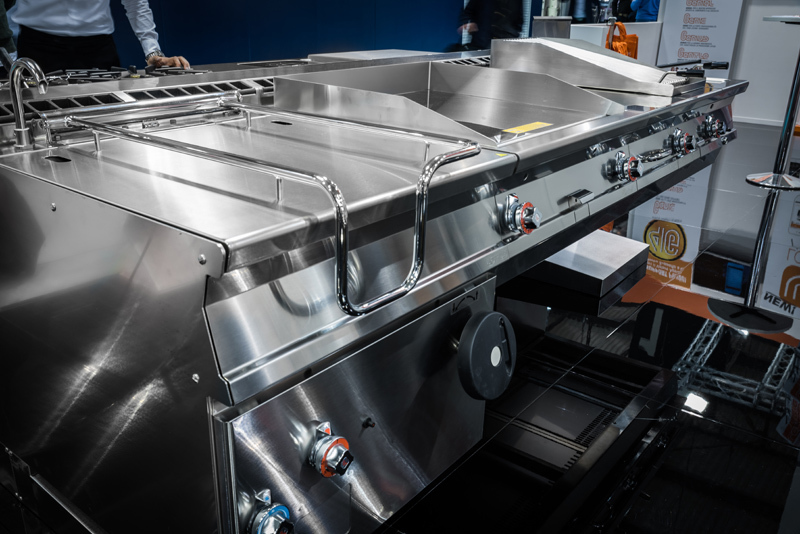 cookers and frankfurter cookers, chilled base elements and salamanders, is designed to be incorporated and integrated into cooking systems capable of dealing with the most diverse of requirements. 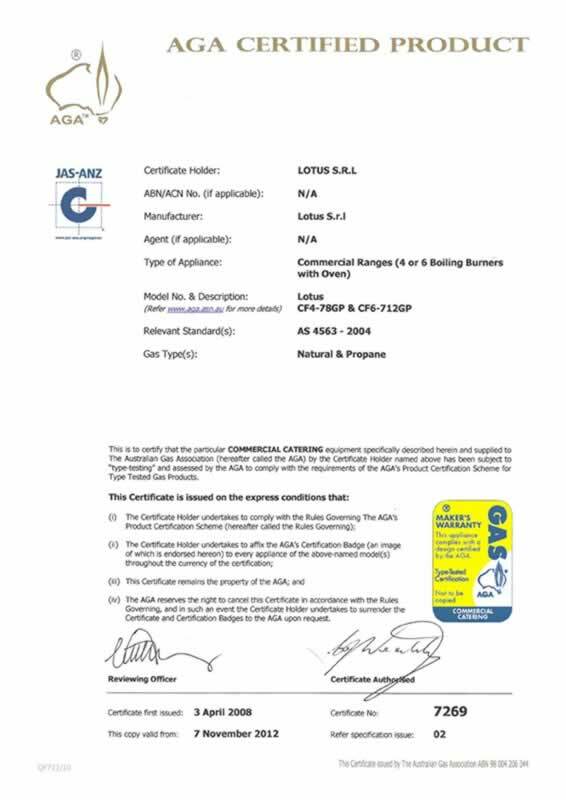 All LOTUS products are CE approved and guarantee compliance with the best safety requirements, making for total reliability, easy care and cleaning. 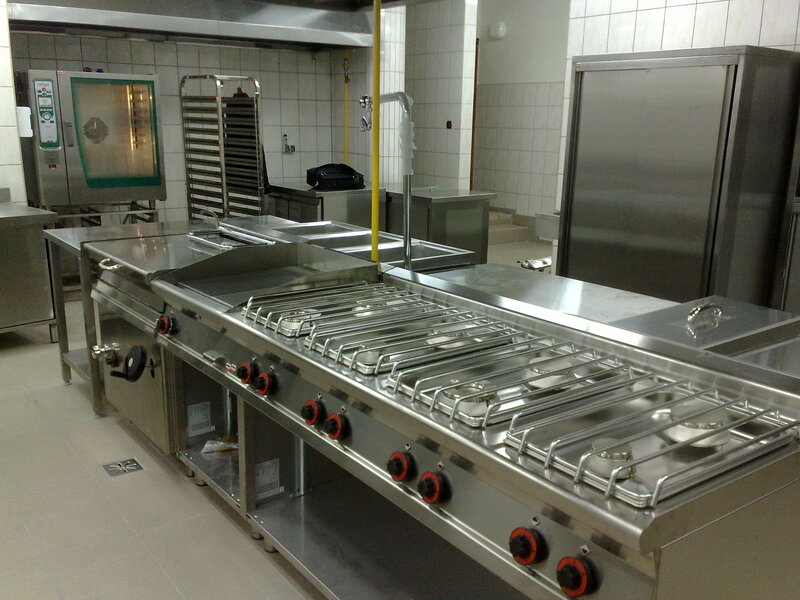 LOTUS products are also used in the hospital sector, a further guarantee of the quality of its products. 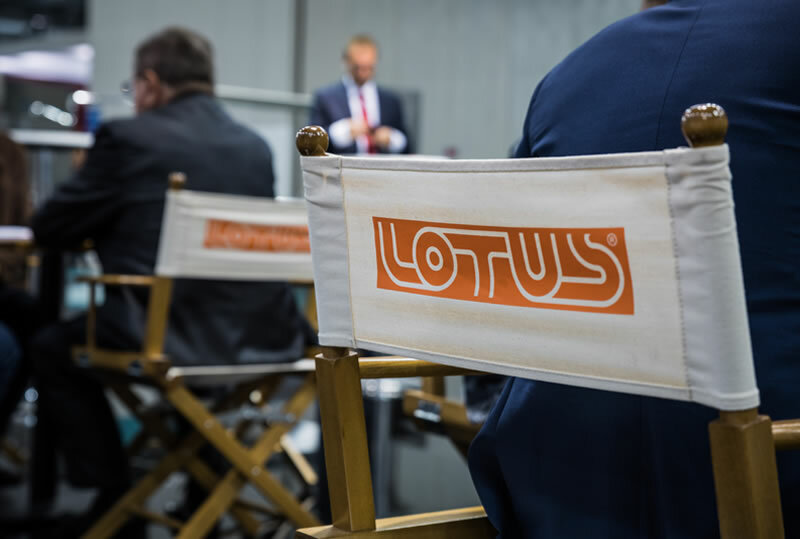 For LOTUS, quality is a highly qualifying feature of its ongoing organisational and managerial improvement process. 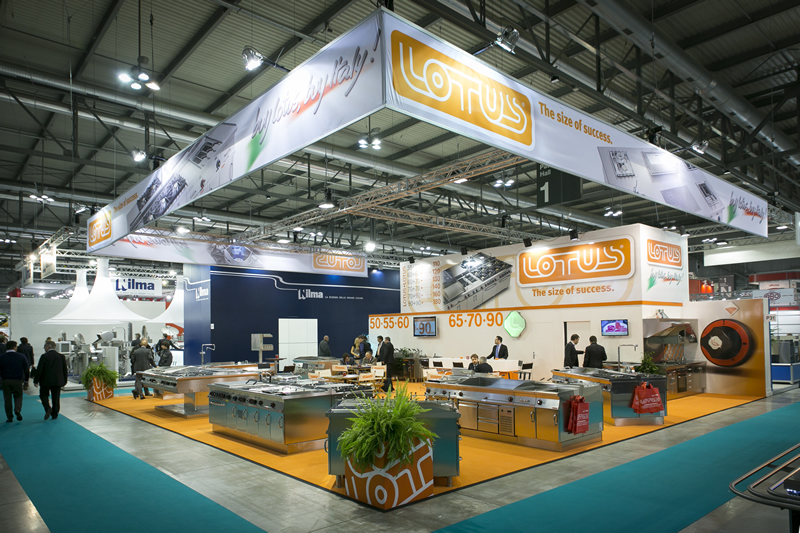 LOTUS believes that its achievements thus far are merely an incitement to give customers even more. 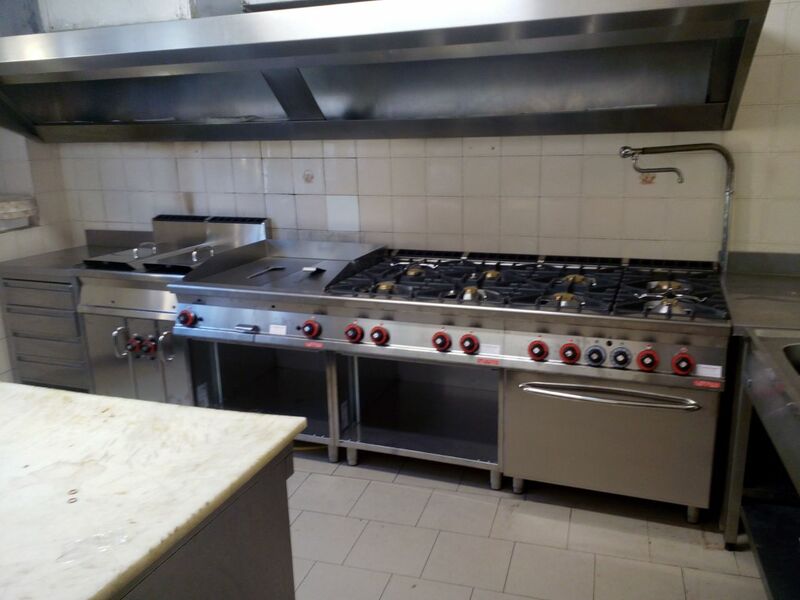 To this end, in order tocomply with international standards and directives, the equipment comes with ETL (Safety + Sanitation, Canada and USA), AGA (Australia) and GOST (Russia) certifications. 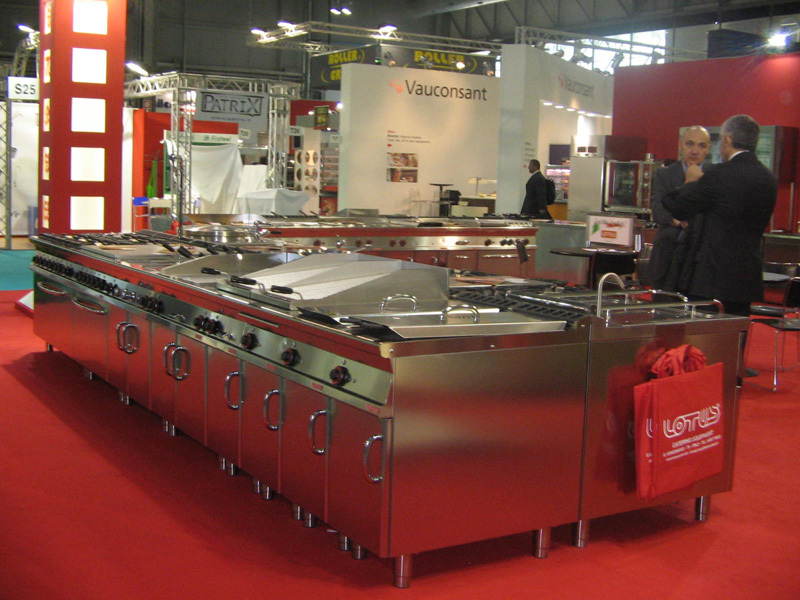 Furthermore, the fryers in the LotusMarine line comply with SOLASrequirements. 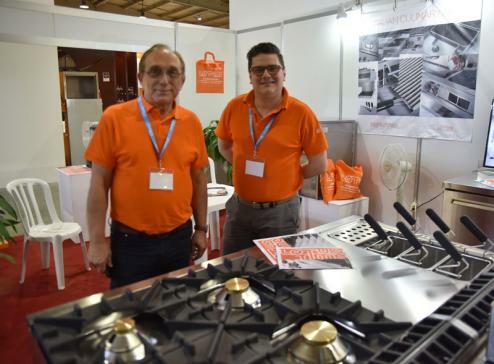 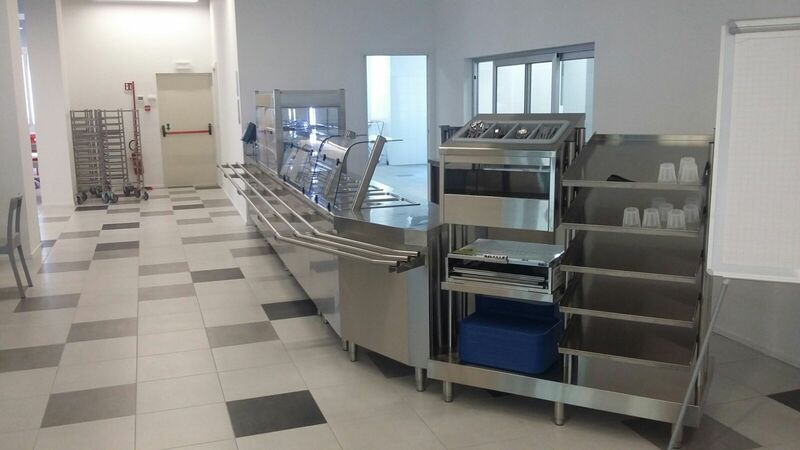 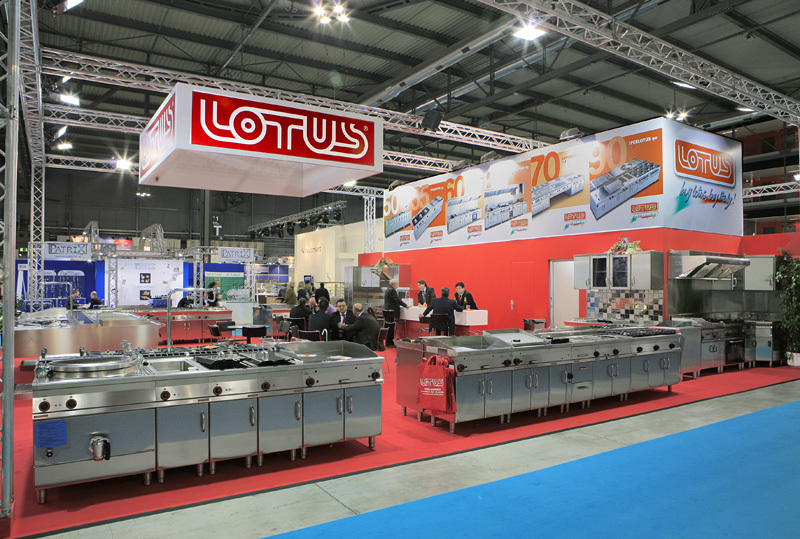 Owing to its ongoing commitment to development, LOTUS has demonstrated that it has the potential and the ability to accommodate concretely and completely the needs of the large-scale catering sector and cooking centres for communities requiring the production of significant numbers of dishes. 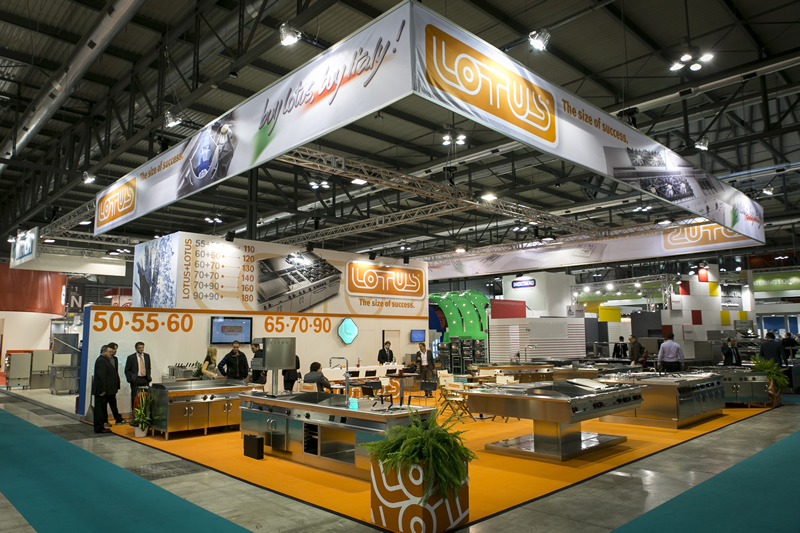 LOTUS is now the benchmark for all catering professionals in search of innovative solutions in terms of technology and construction, with a view to optimising and reducing consumption levels, and for planners, architects, designers, interior decorators that like to suggest and design singular layouts featuring an accurate, tailor-made, high performance design. 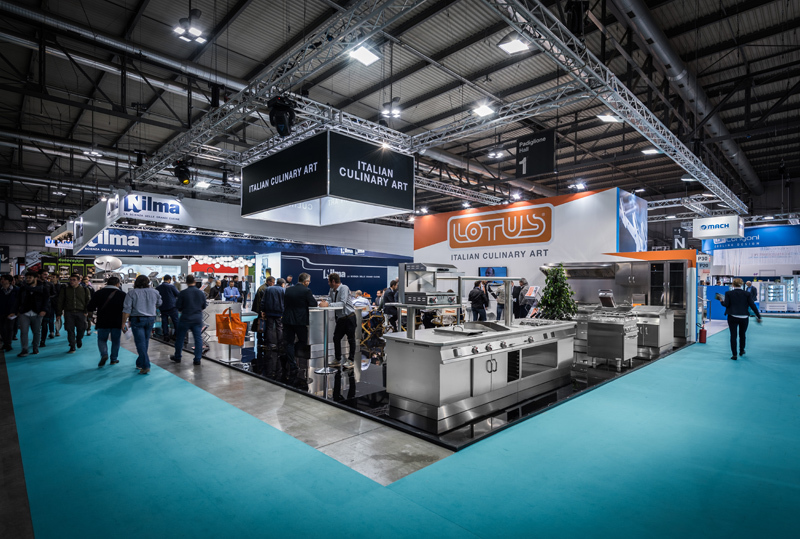 Moreover, worth mentioning is the extreme versatility, afforded by the countless combinations of product lines and all our perfectly integrating products, that widens the possibilities of creating the kitchens of the future: in full view, attractive and for everyday use, practical and ergonomic, marked by perfectly co-ordinated styling and functional like no other but LOTUS can guarantee, thanks also to its manufacturing performed entirely in Italy. 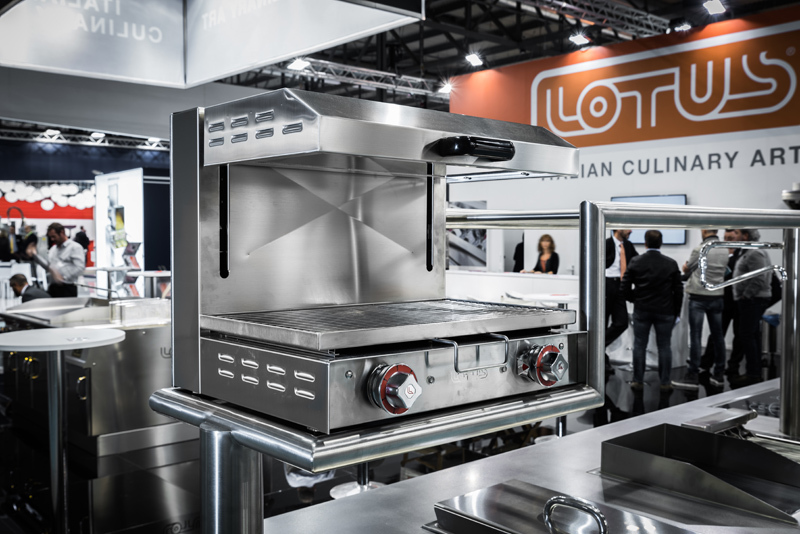 Thanks to its new product line, FreeLotus©, Lotus expands its scope of response to the new demands for professional built-in cooking lines, which can be fitted in enbloc solutions for those in search of an important, efficient and reliable cooker, the ideal choice also for those who want to add a touch of true professionalism in the kitchen of their apartment or house. 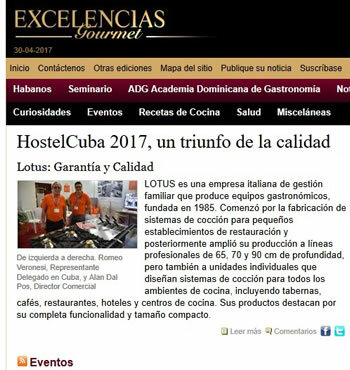 LOTUS guarantees an easy and deductive offer system by using a clear method of description of the offer for every single unit. 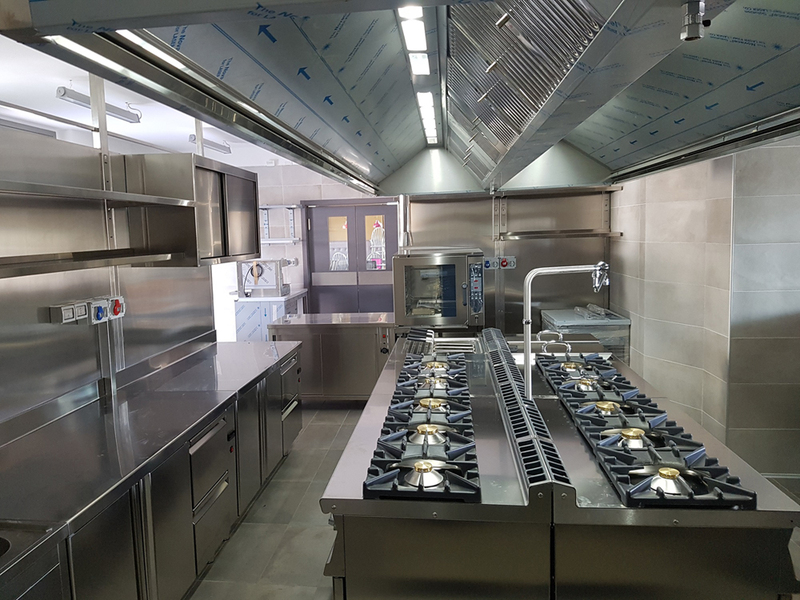 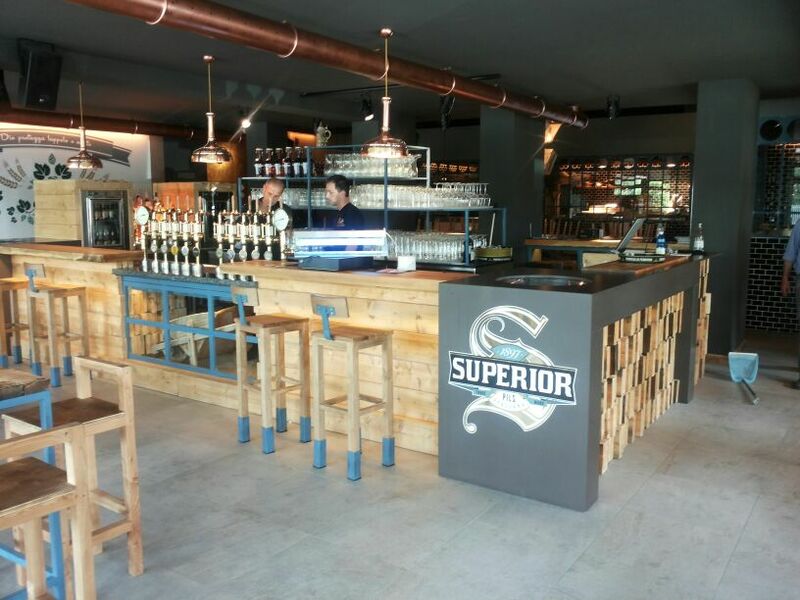 This has been made possible by the fact that the company plans and designs directly the interior layout and has a direct experience of many tailor made interventions, which have already been realized and installed. 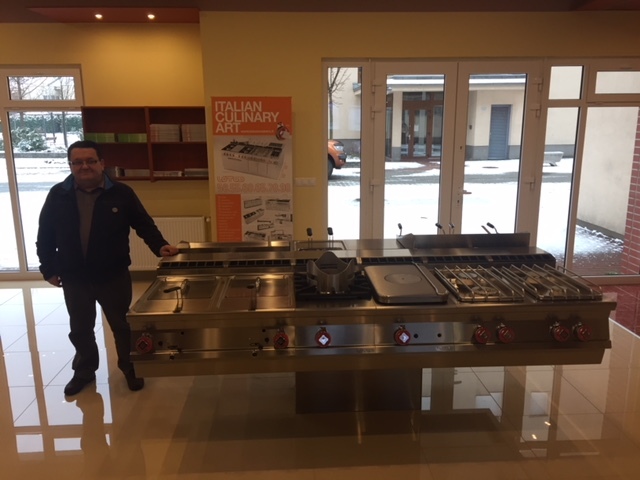 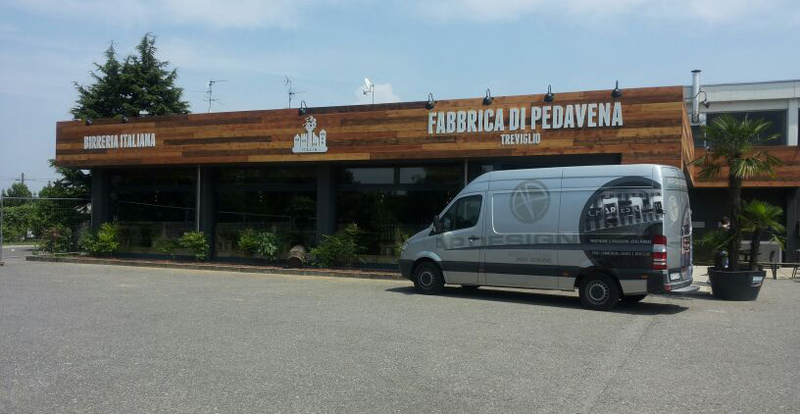 Last but not least, it should be considered that the whole production is made in Italy and precisely in its own factory with prompt delivery. 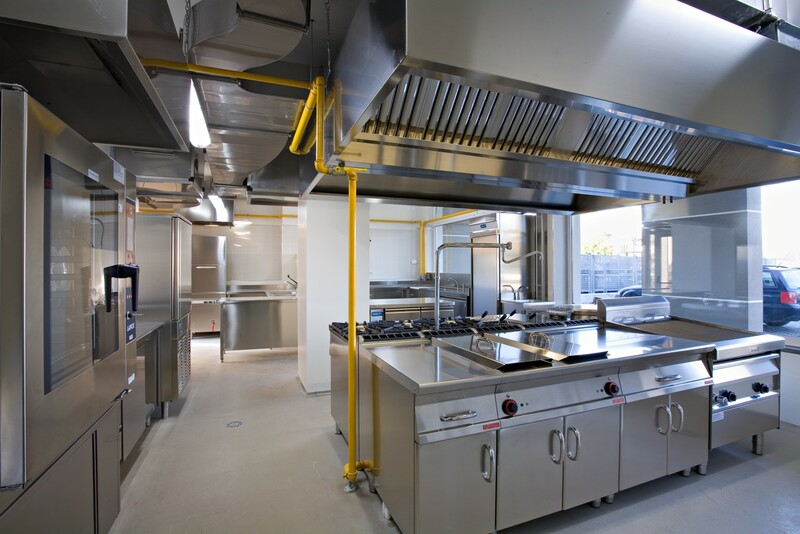 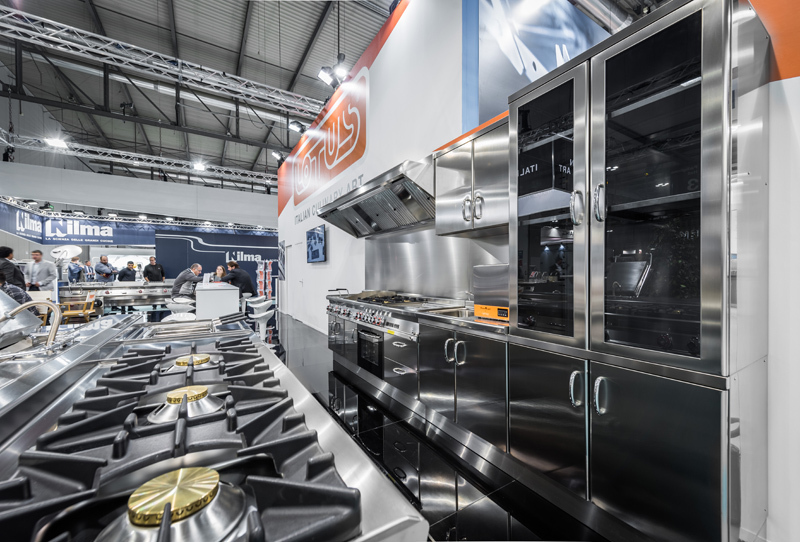 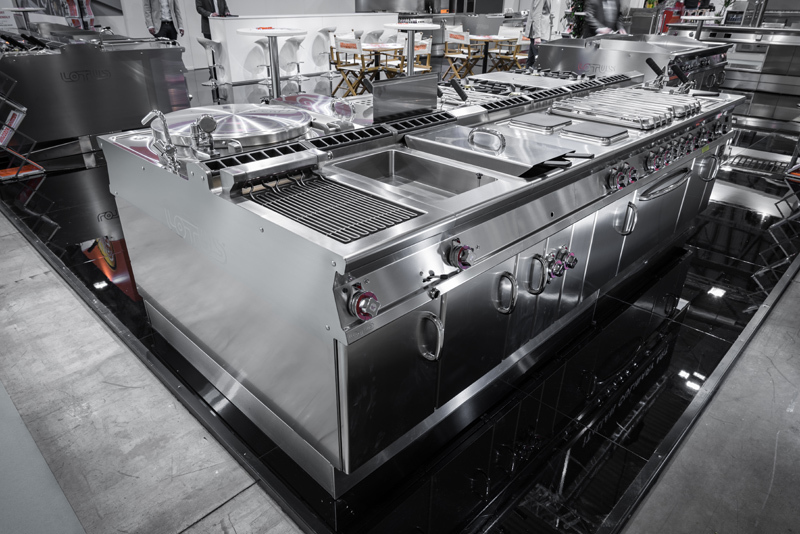 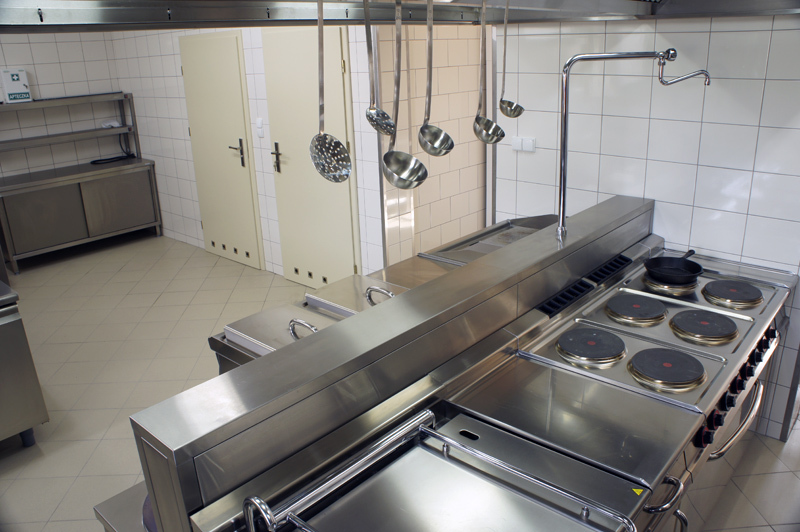 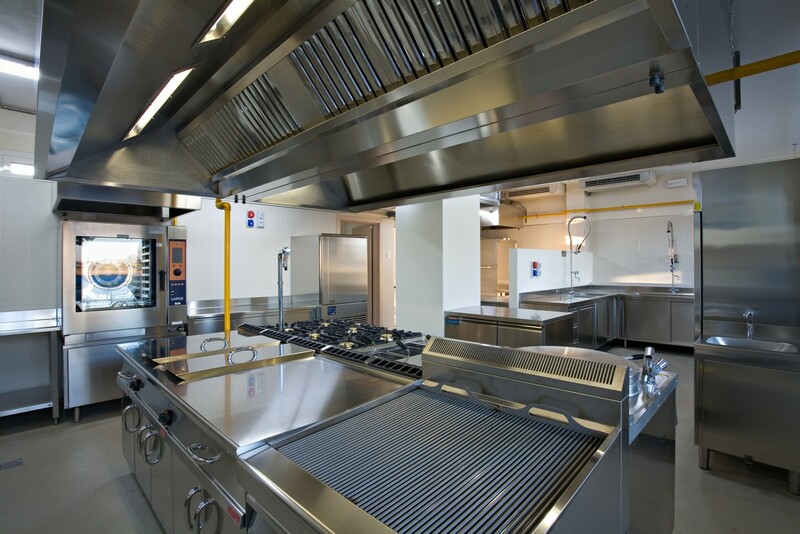 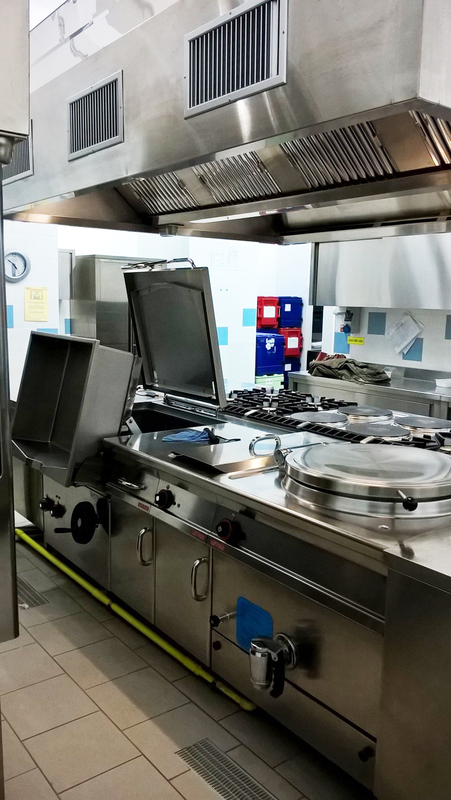 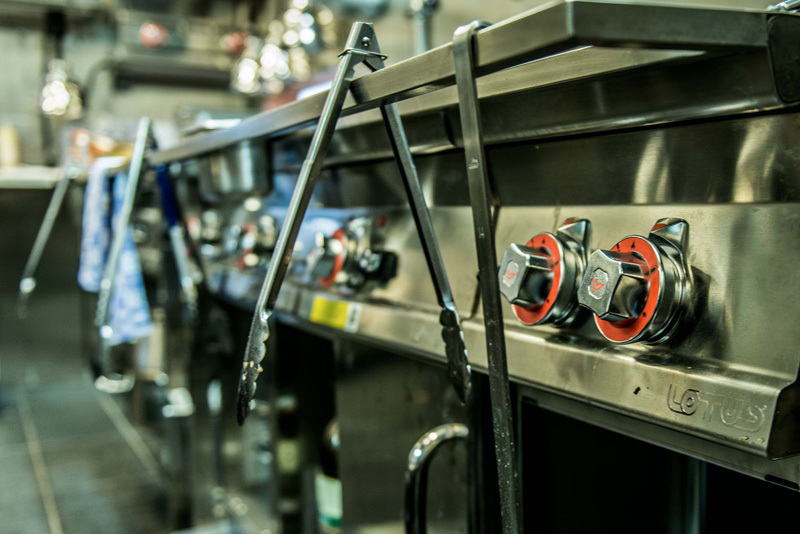 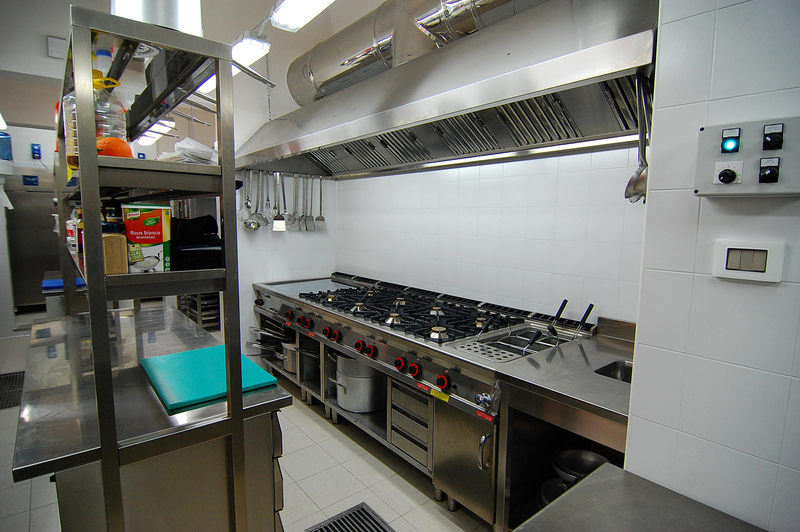 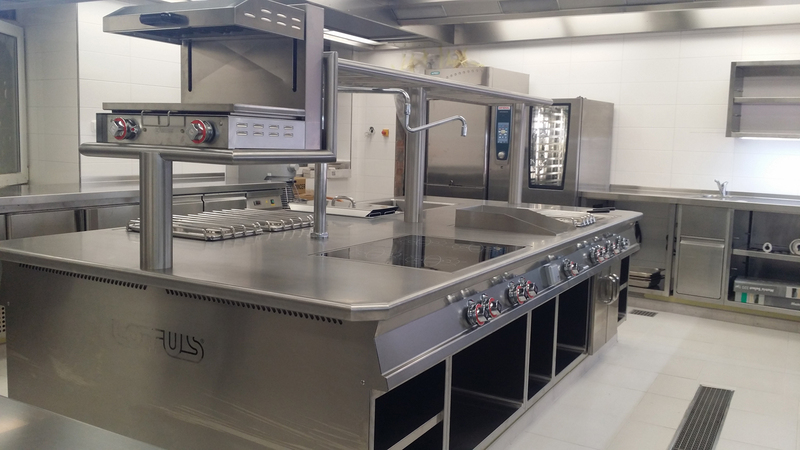 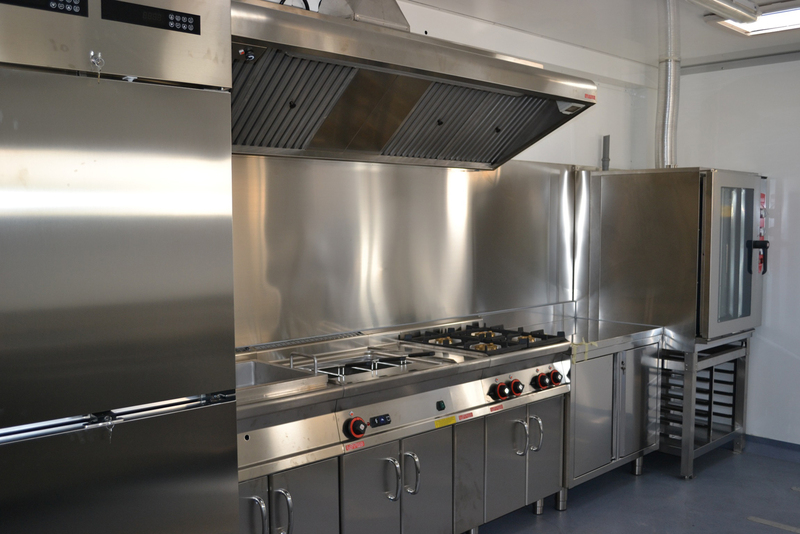 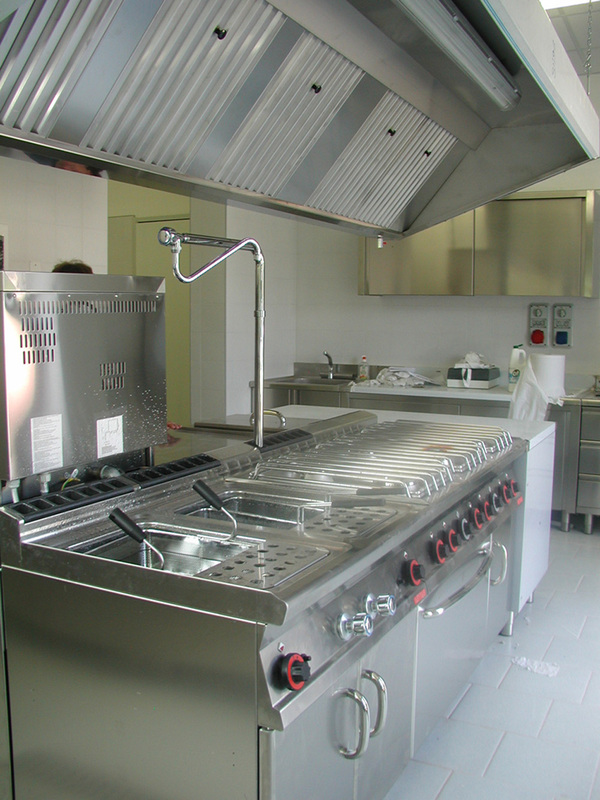 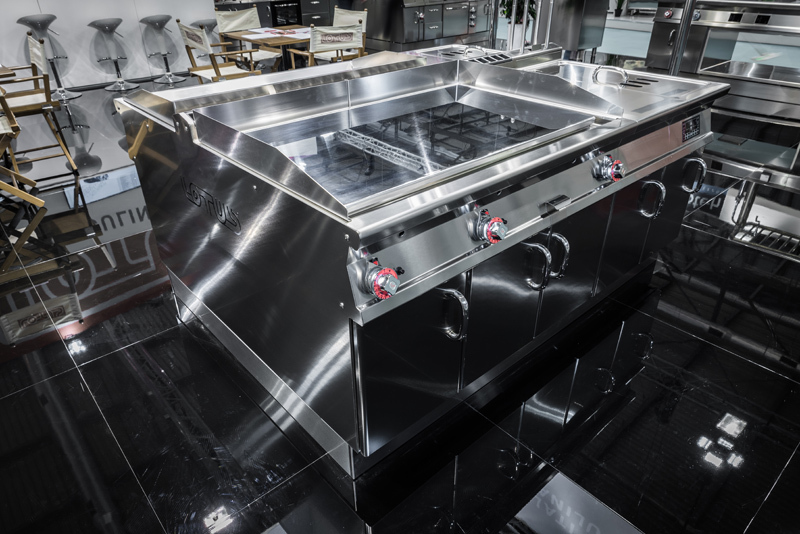 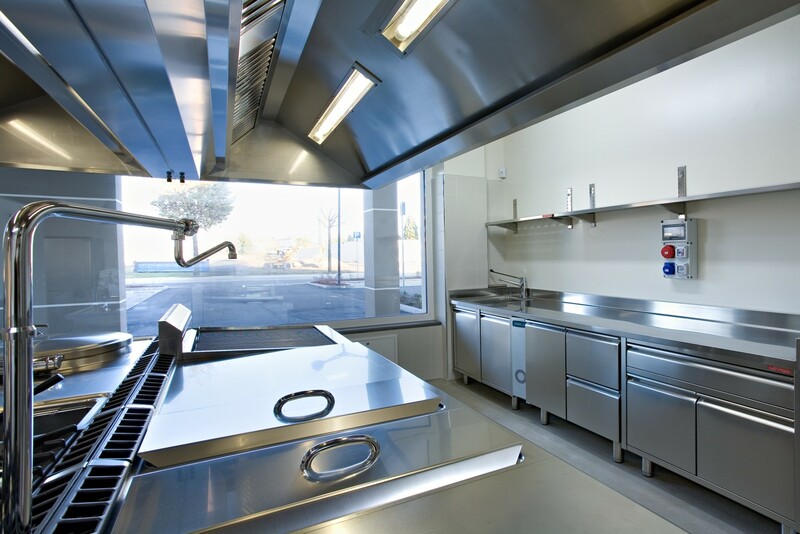 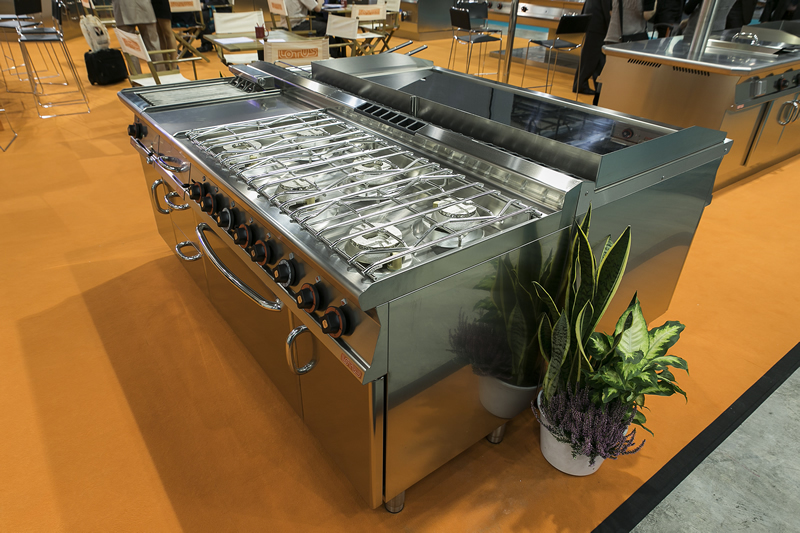 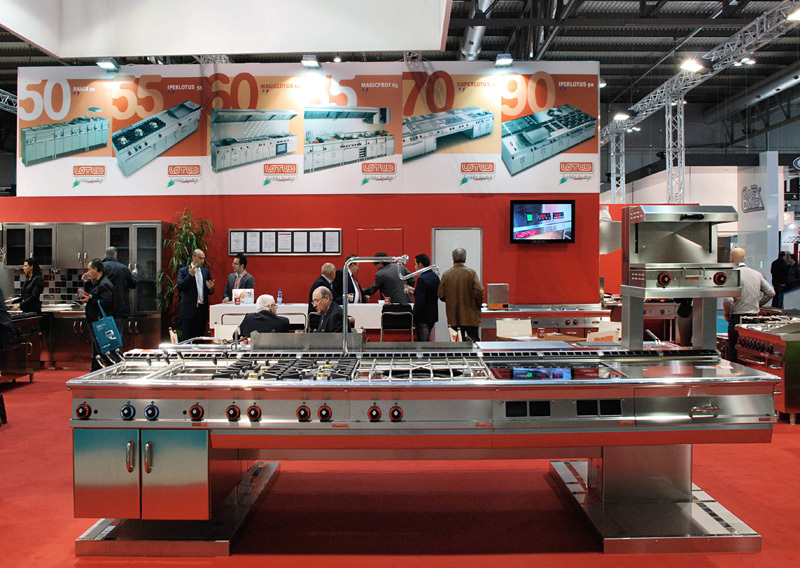 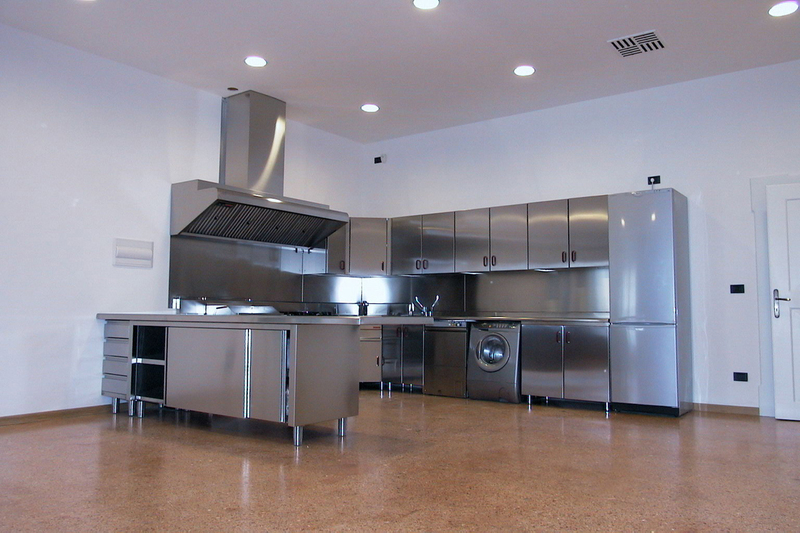 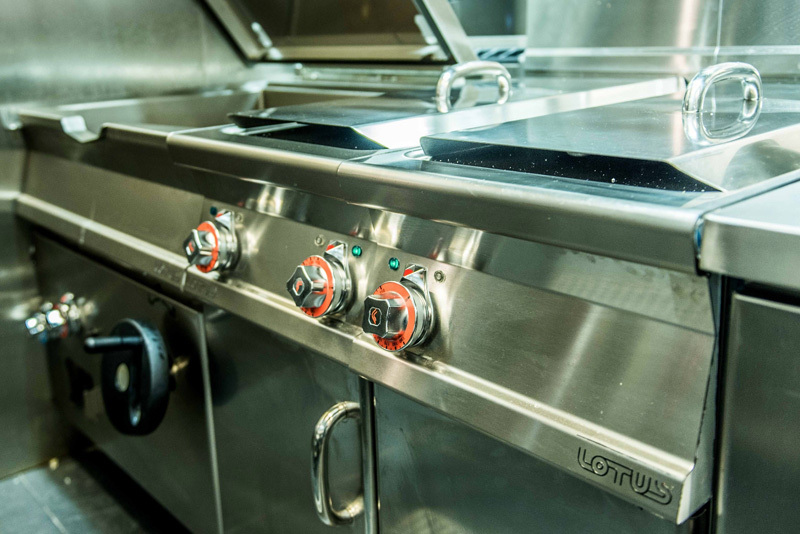 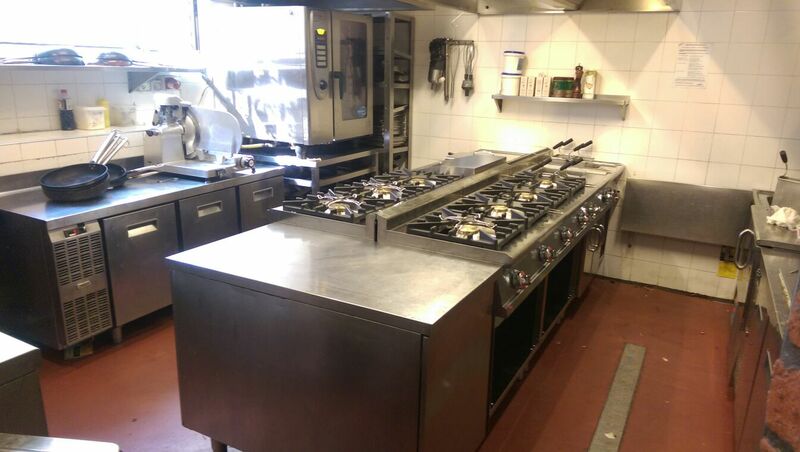 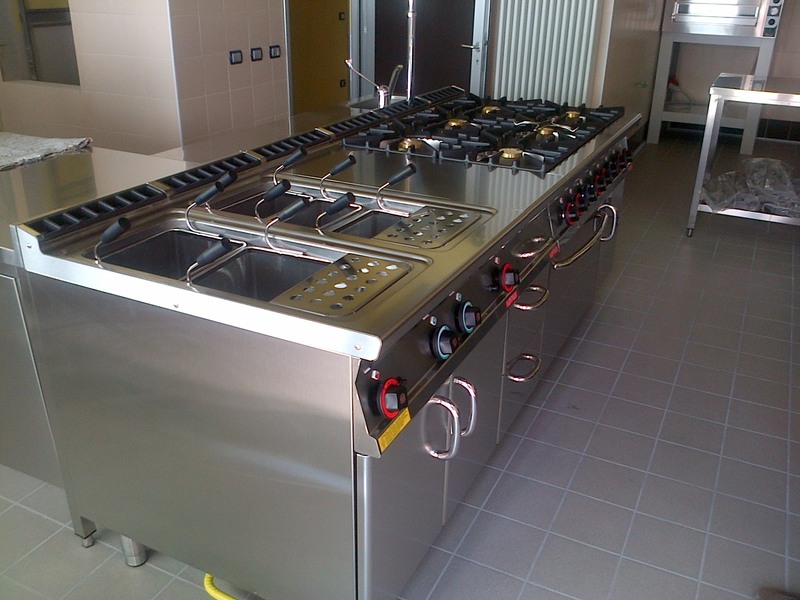 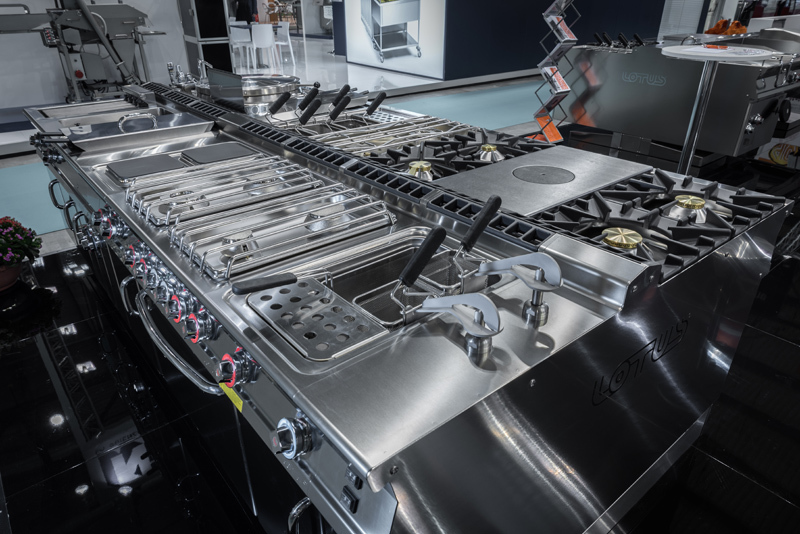 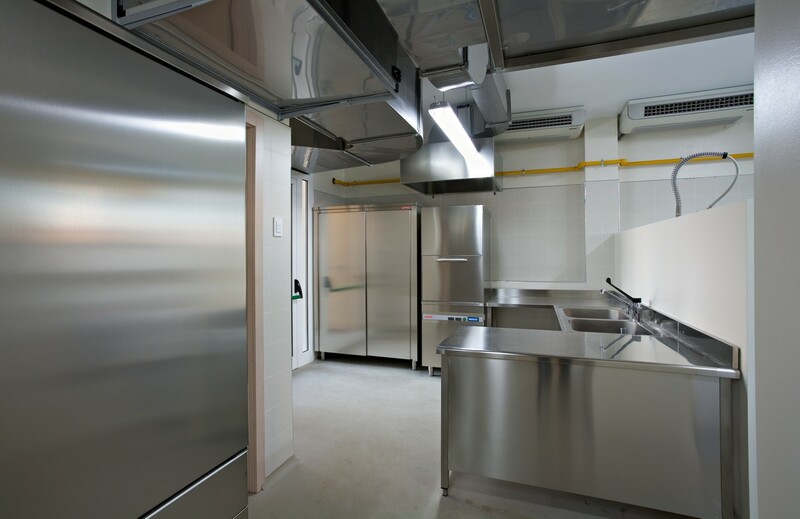 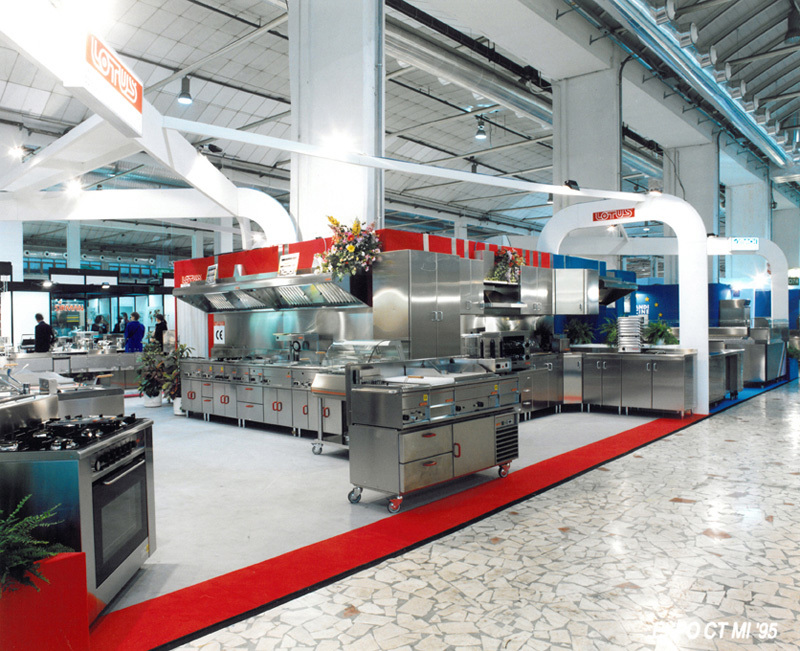 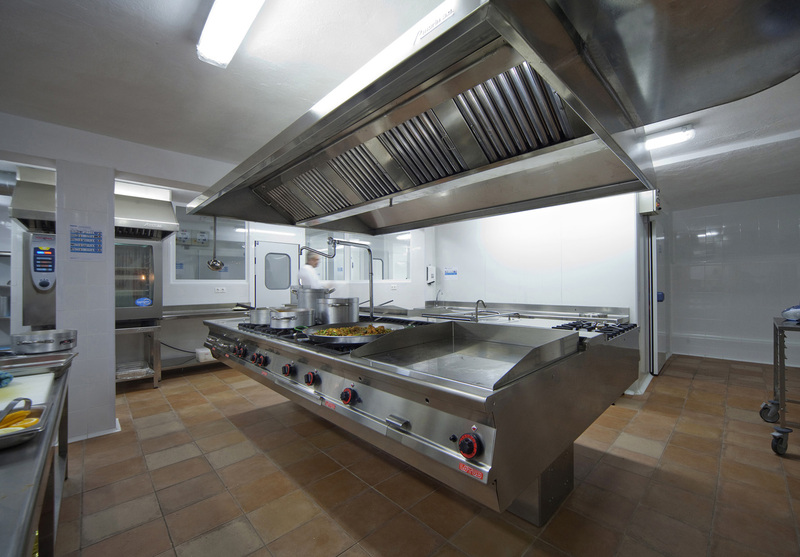 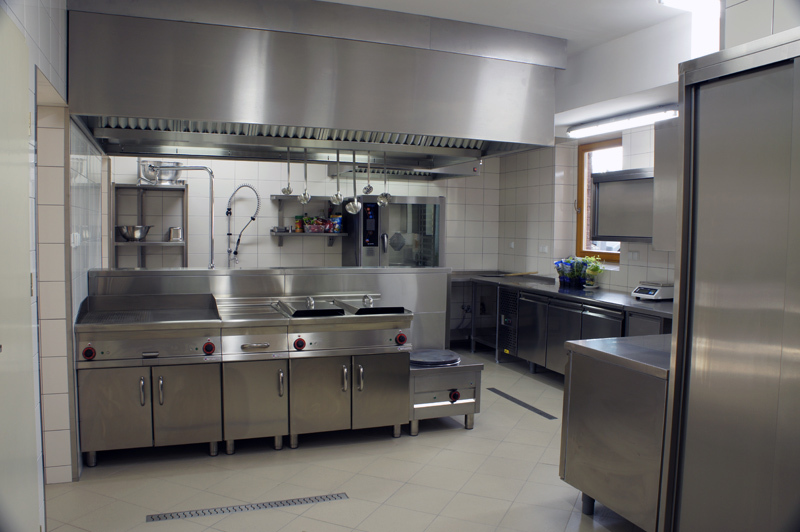 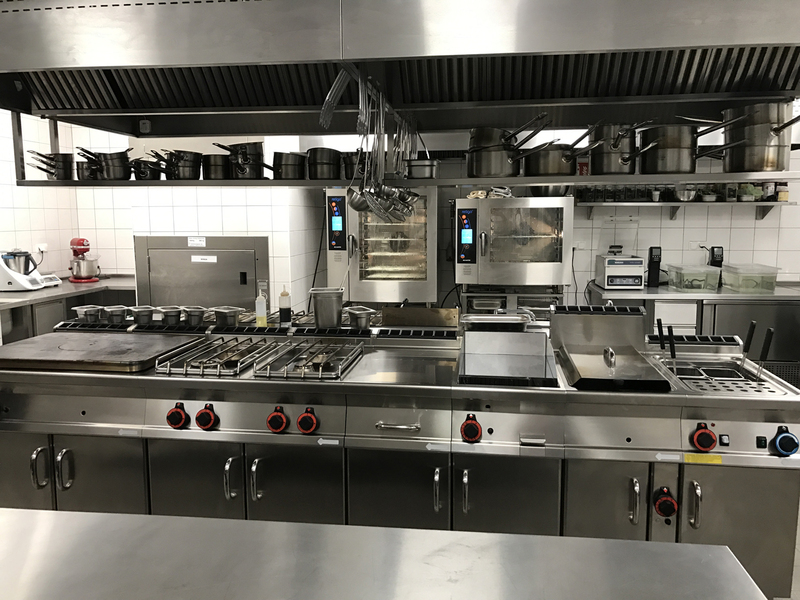 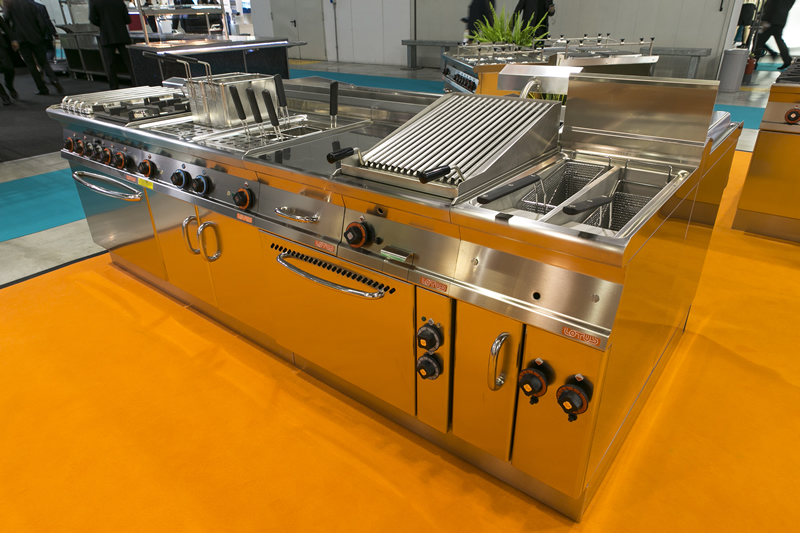 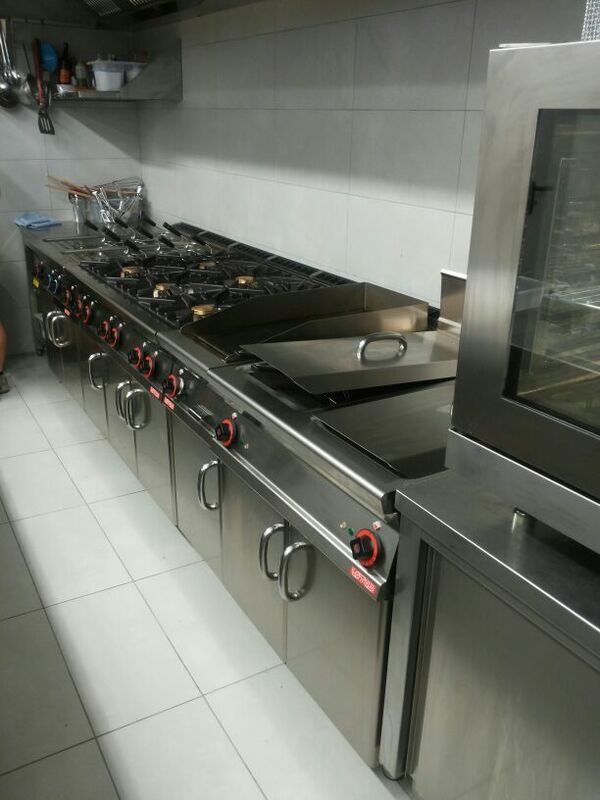 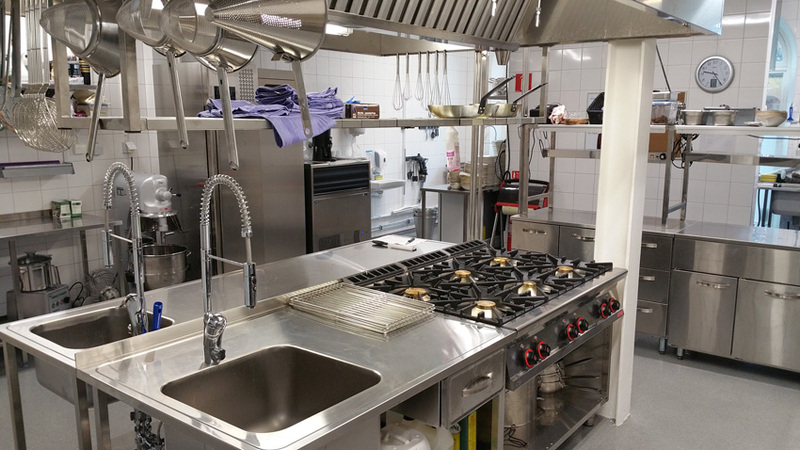 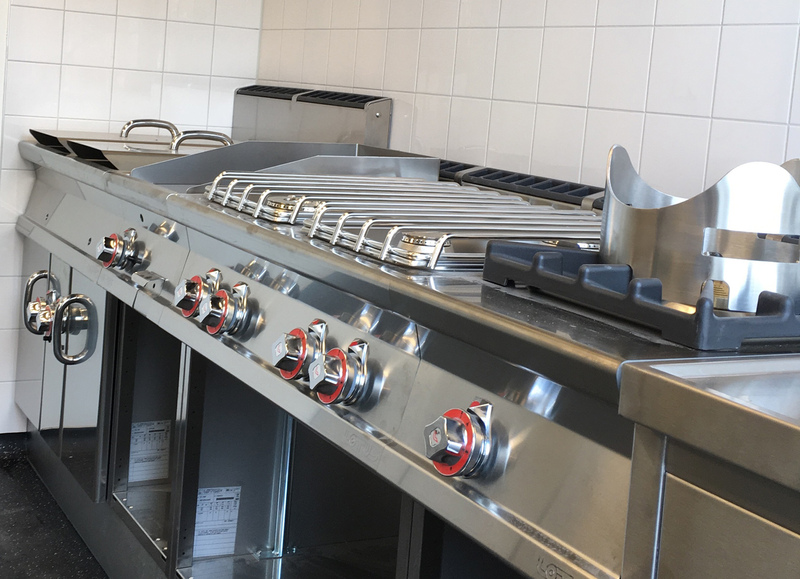 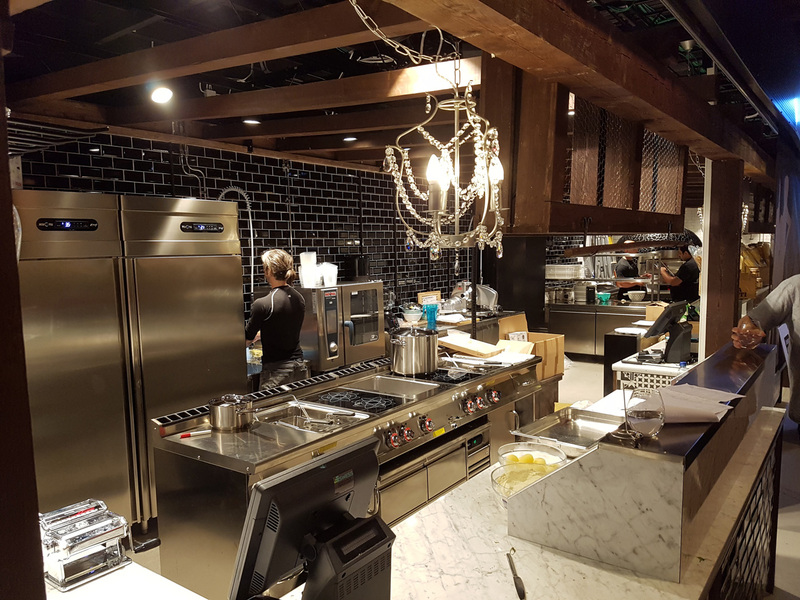 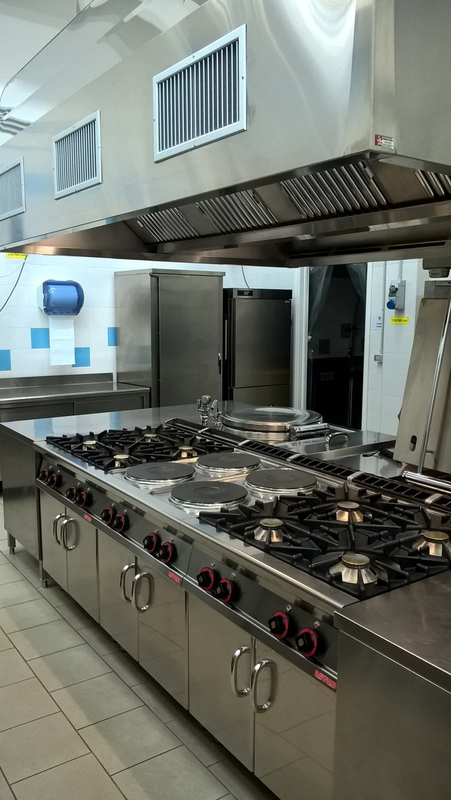 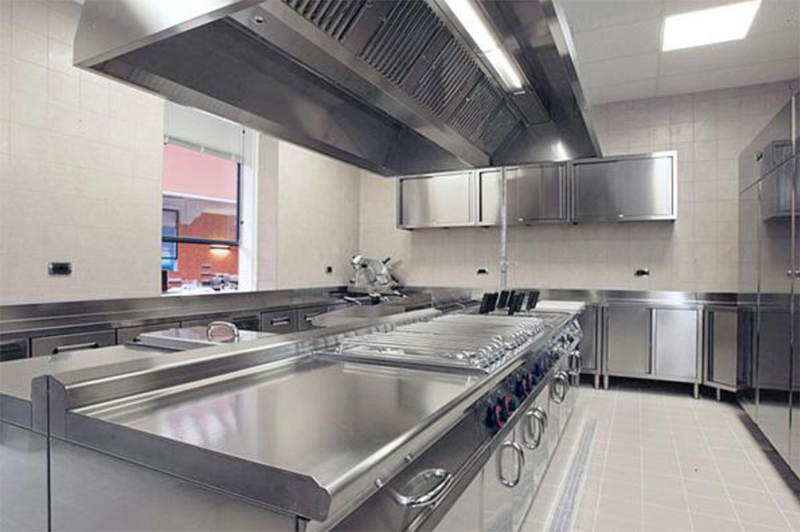 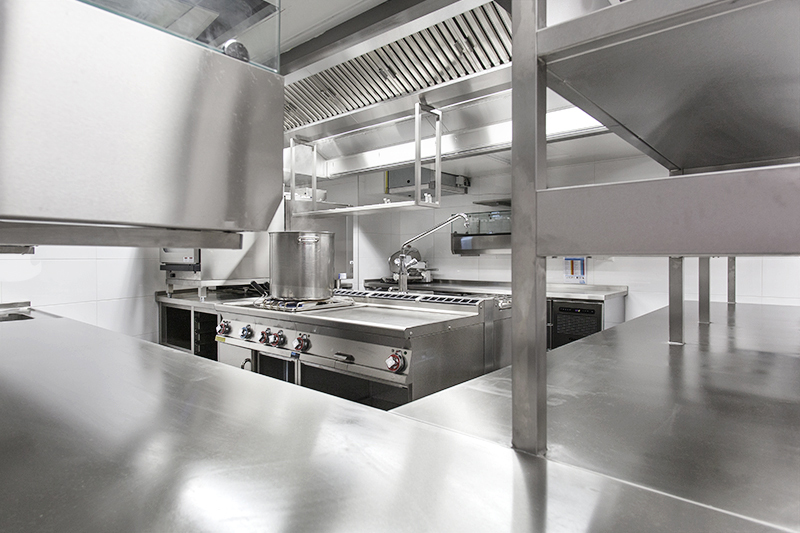 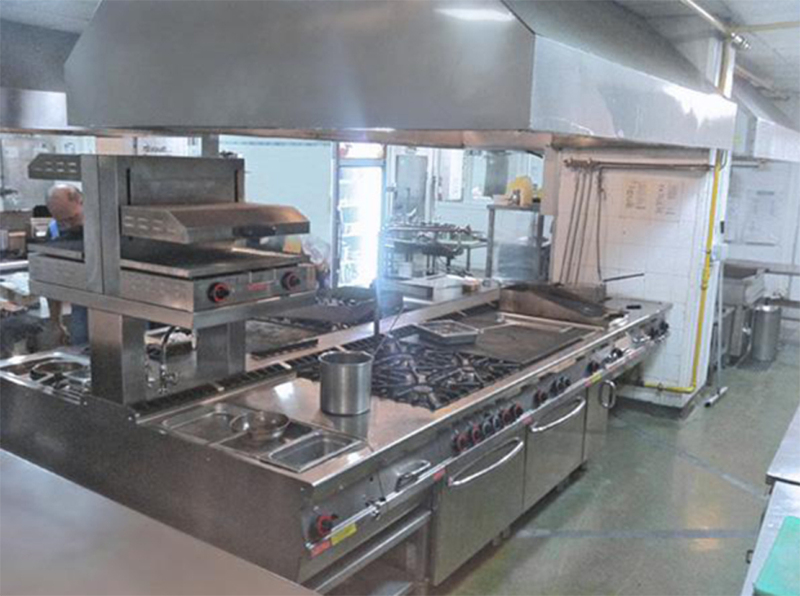 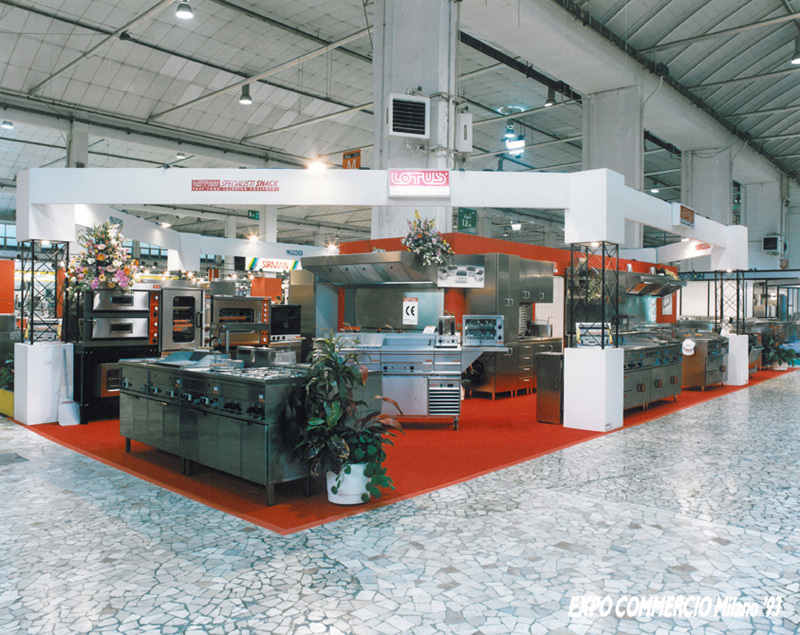 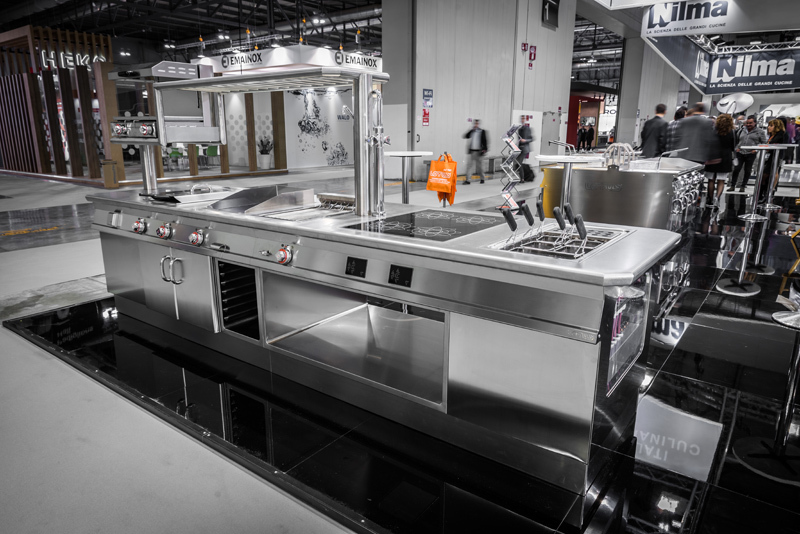 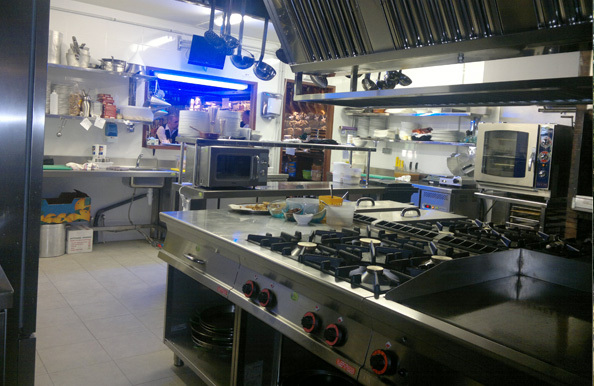 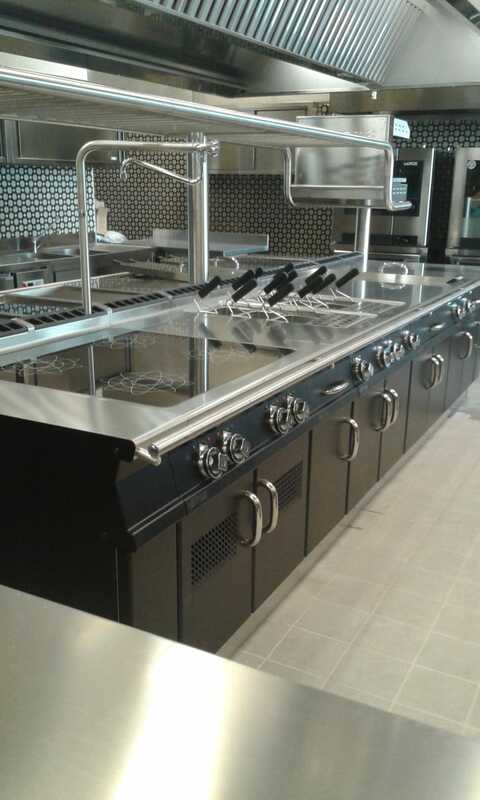 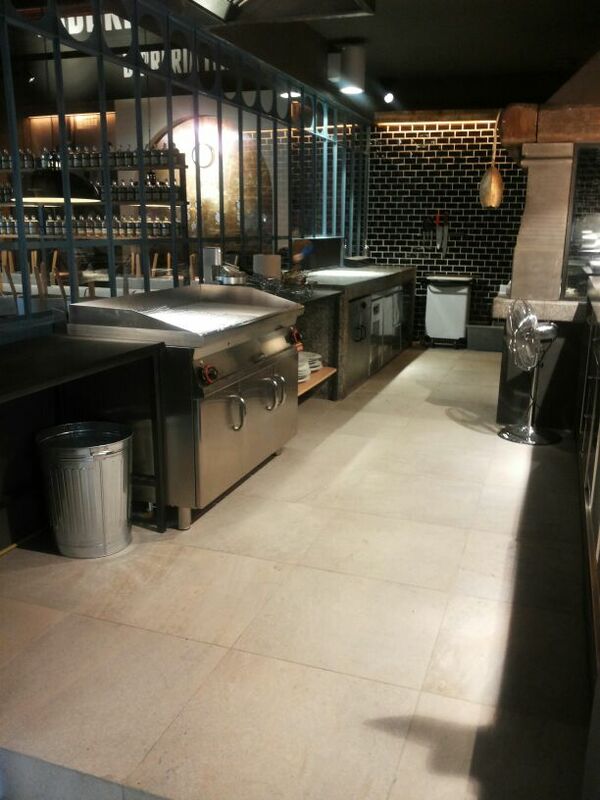 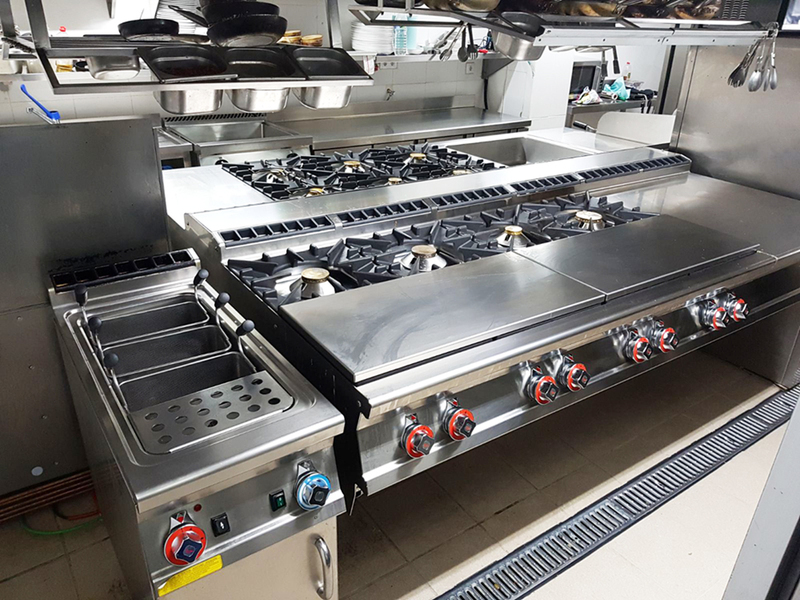 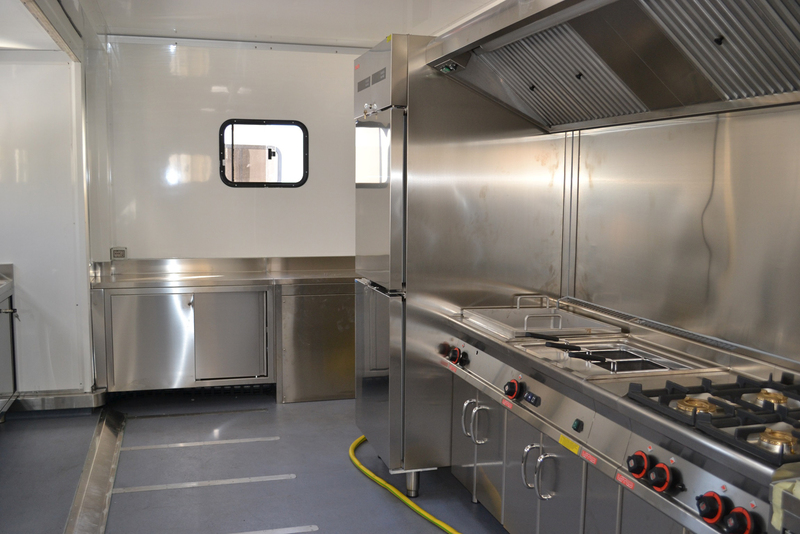 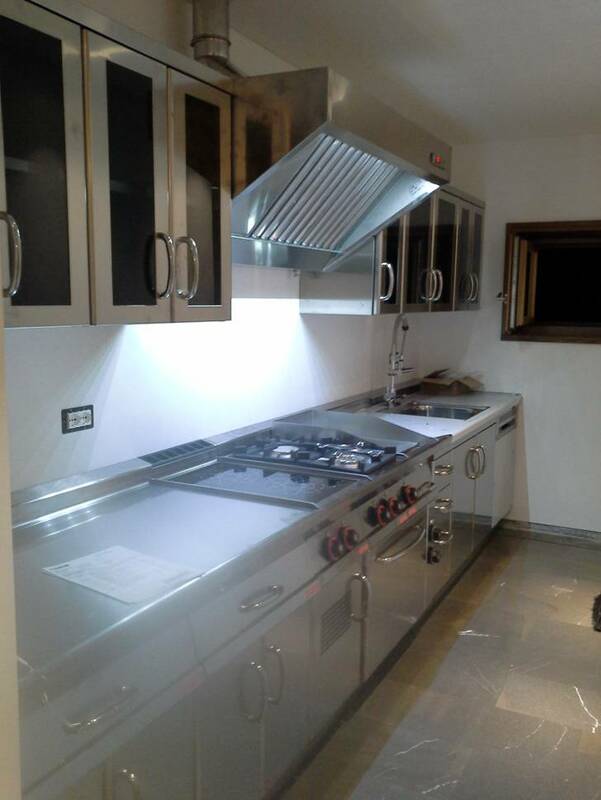 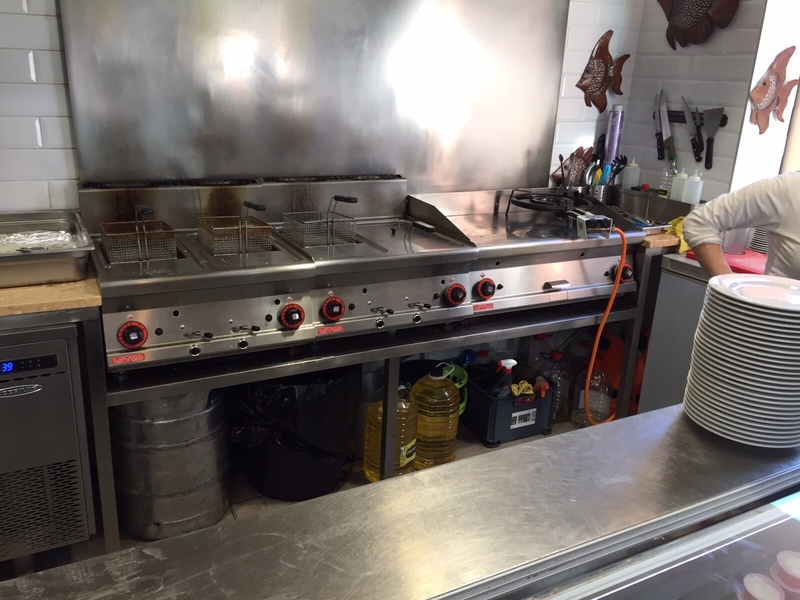 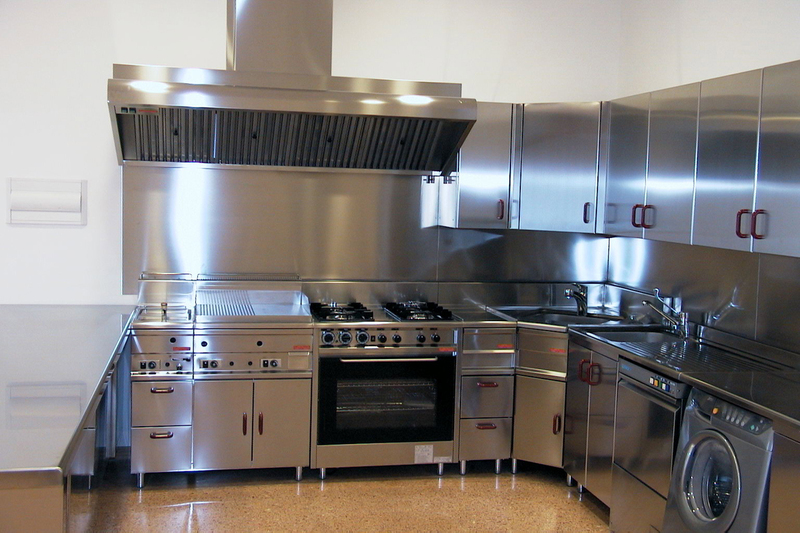 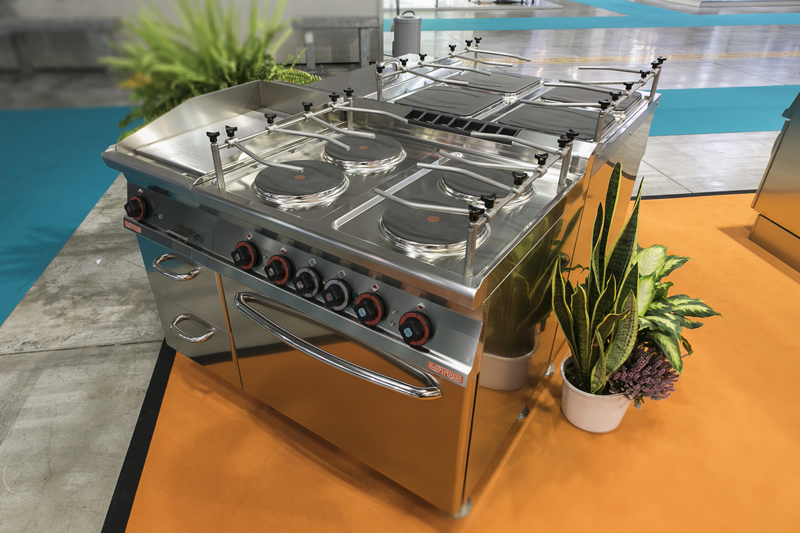 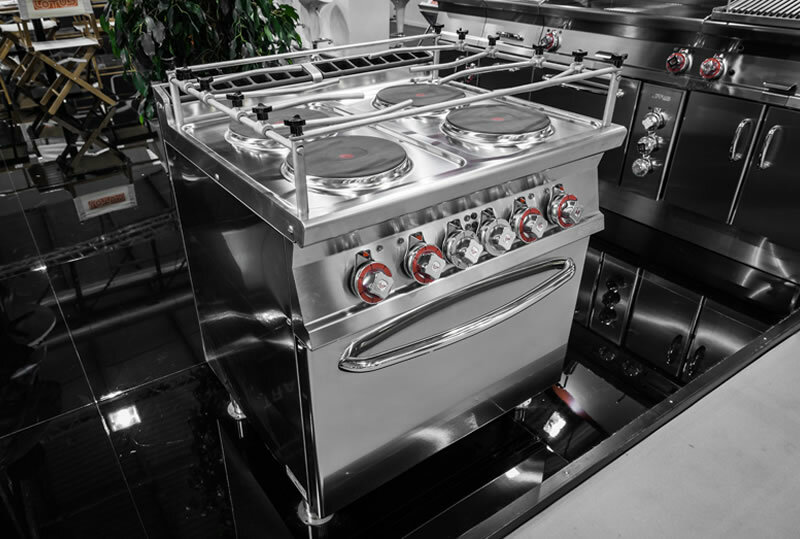 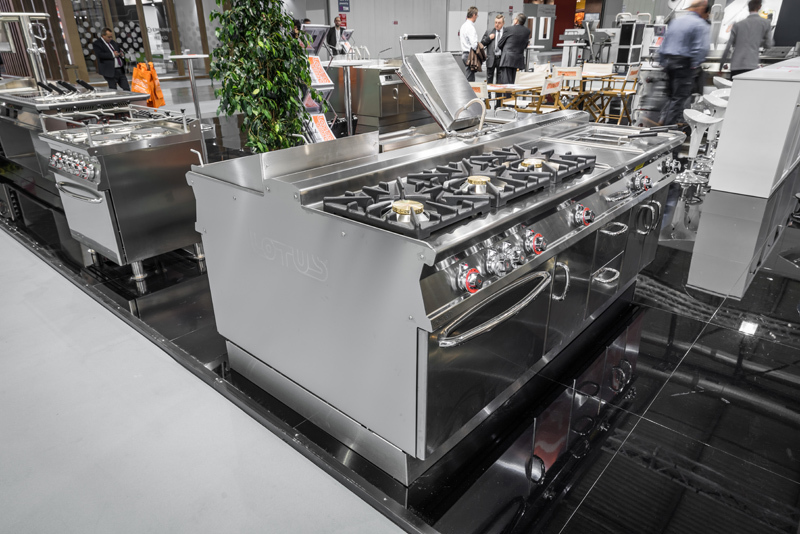 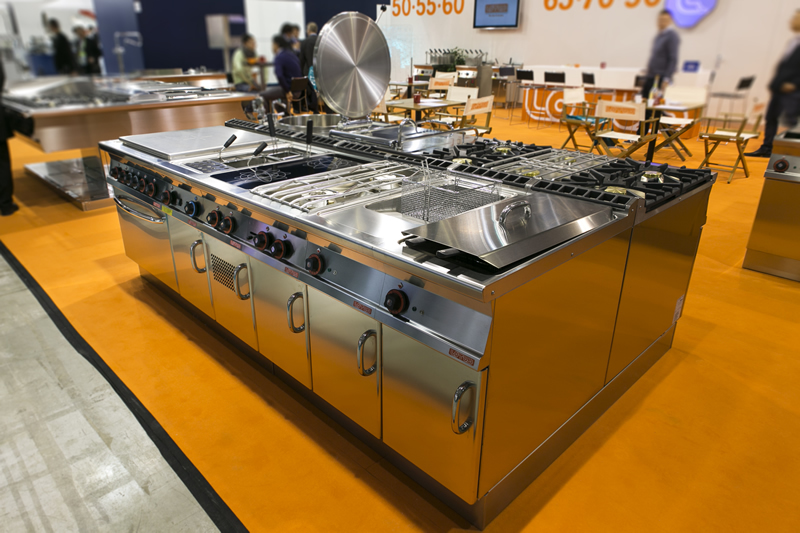 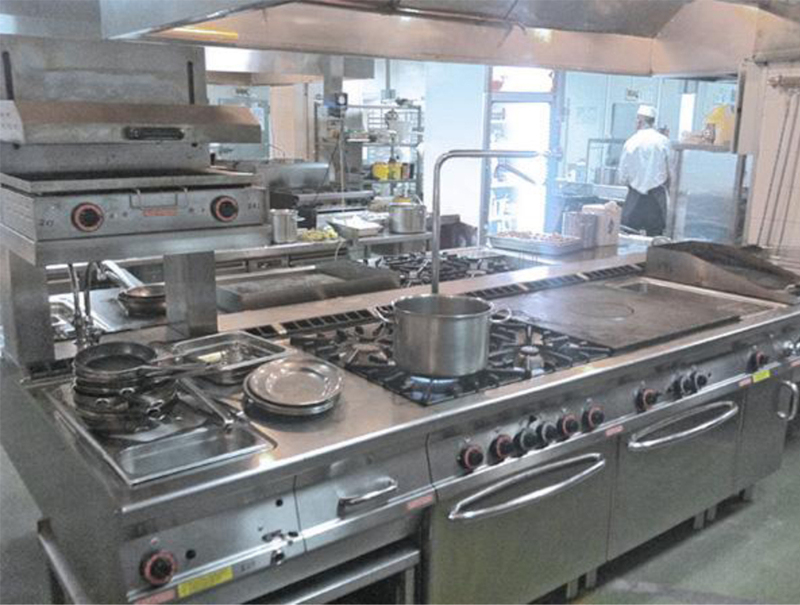 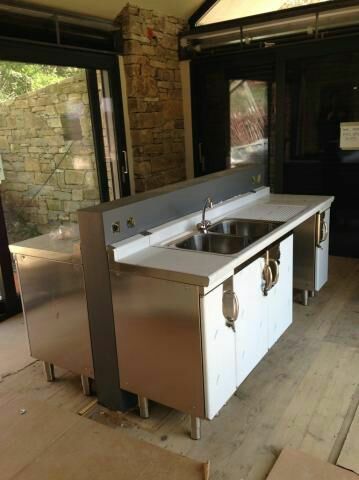 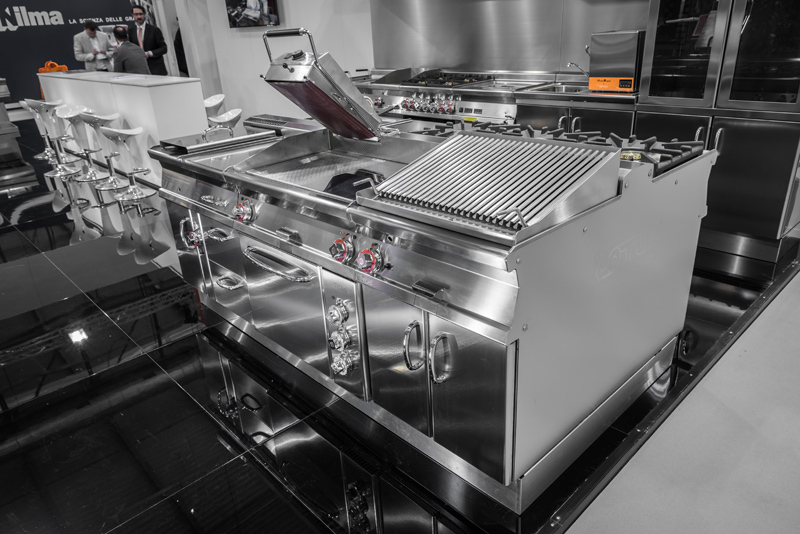 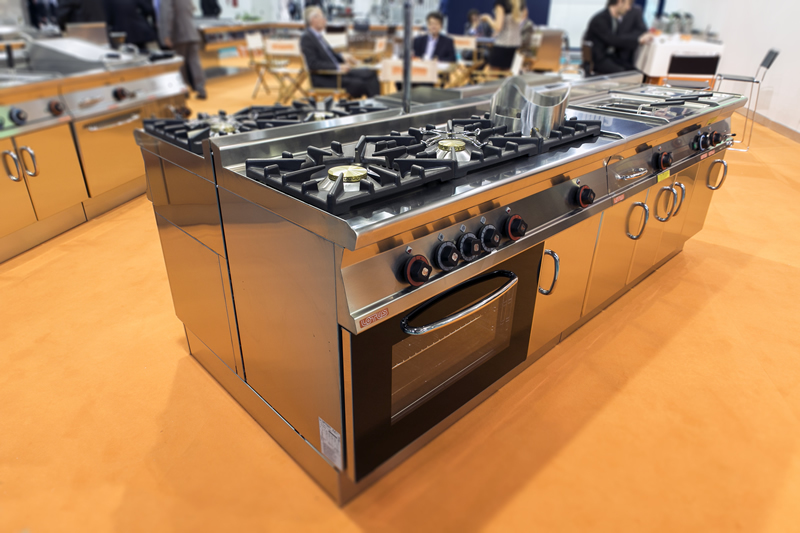 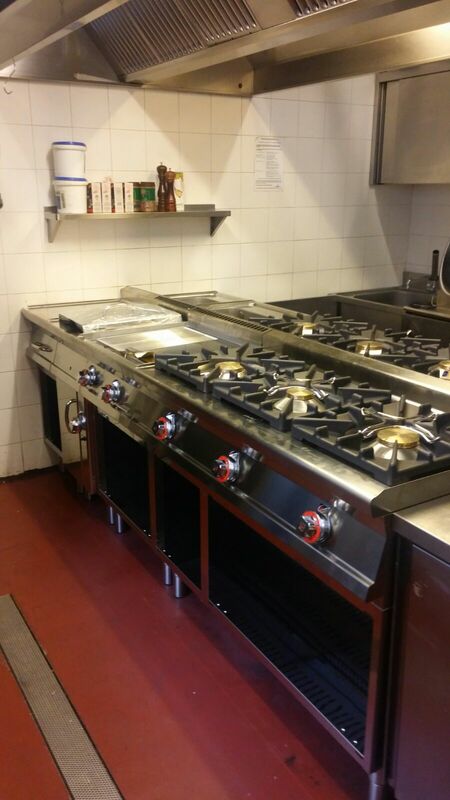 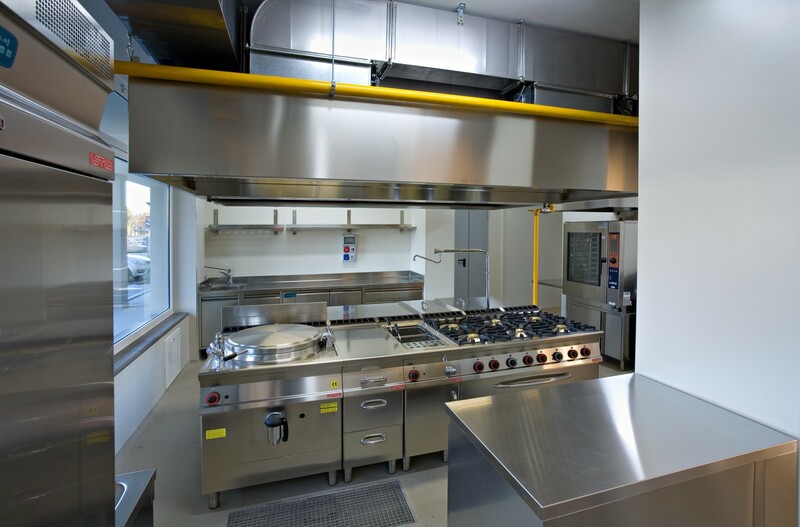 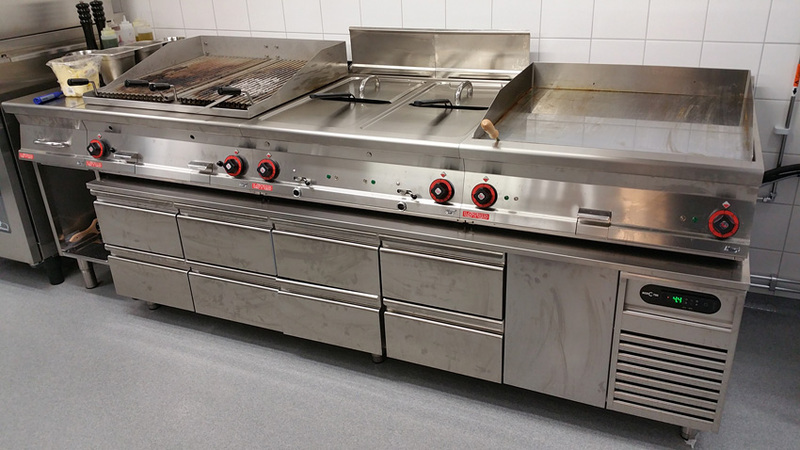 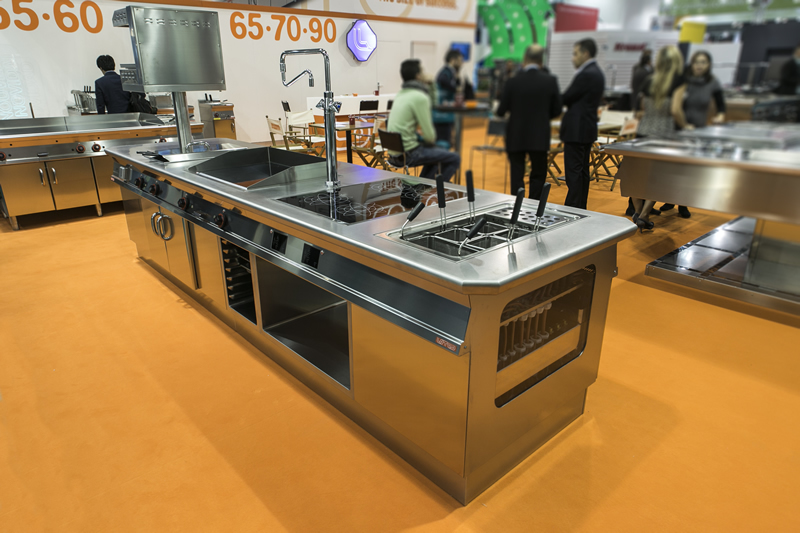 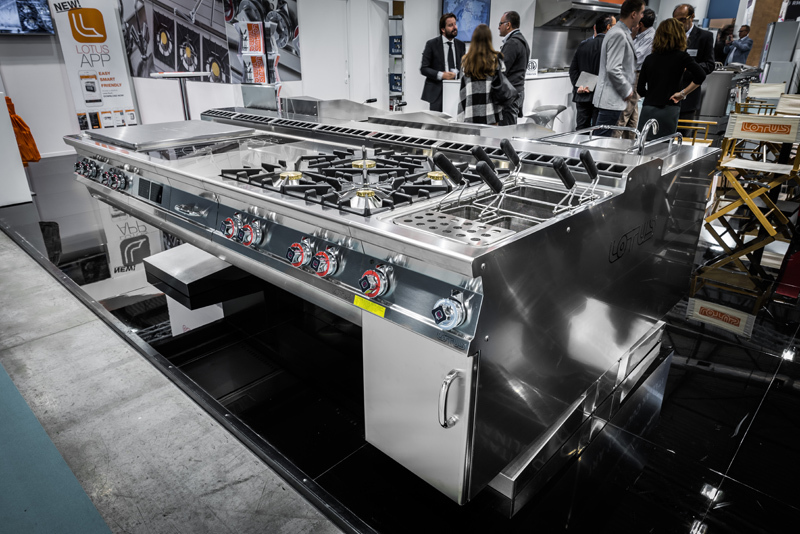 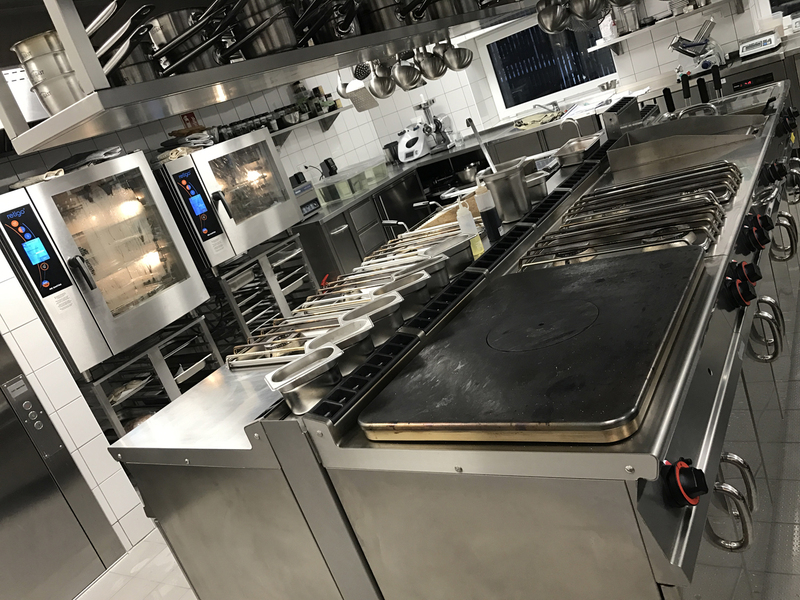 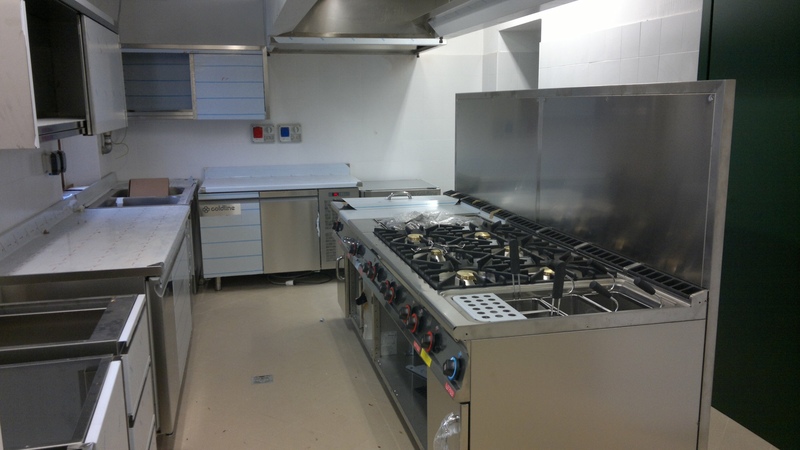 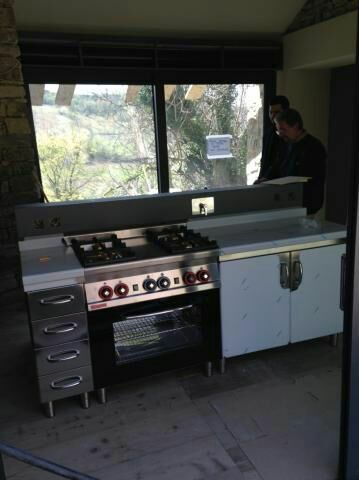 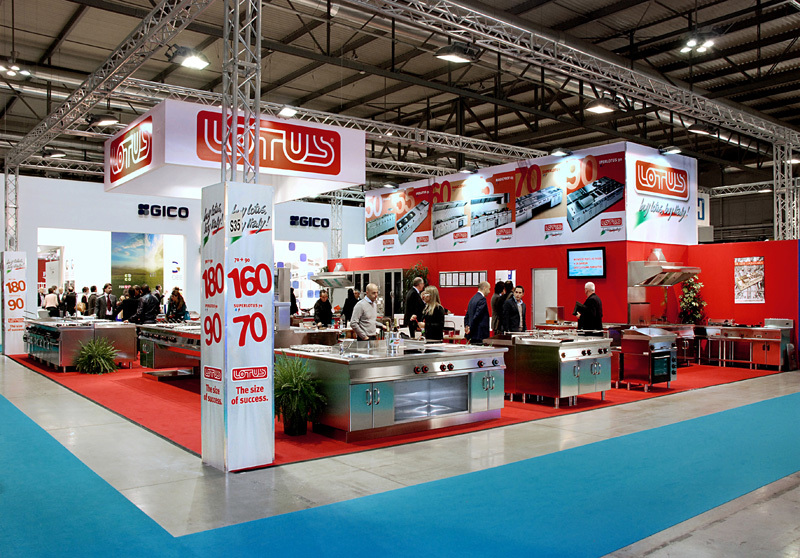 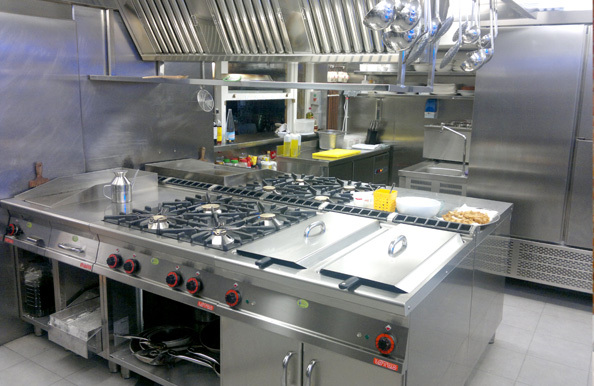 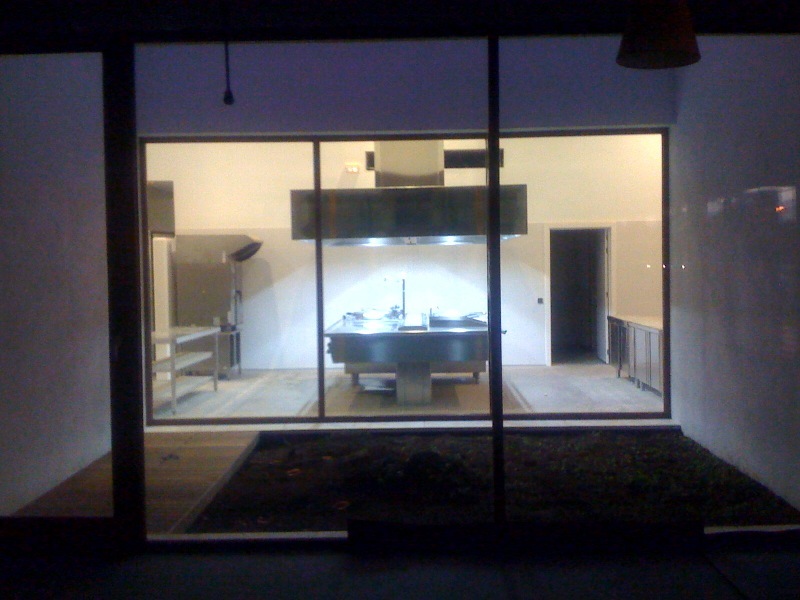 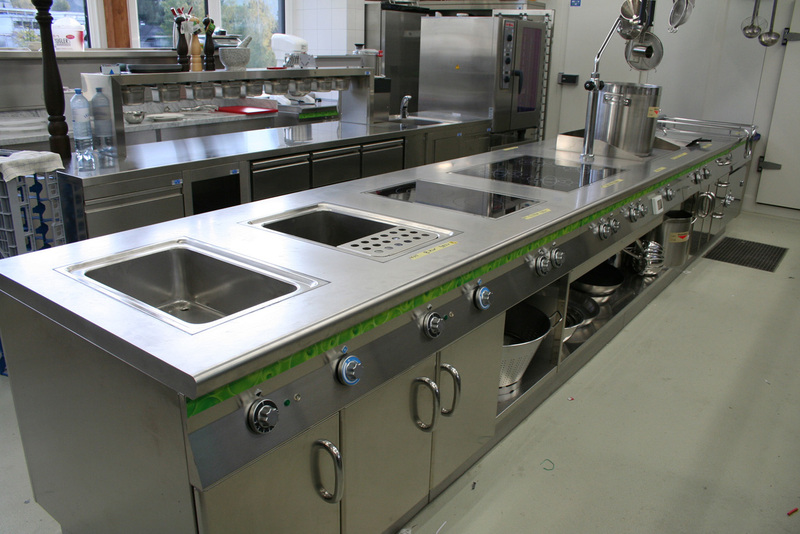 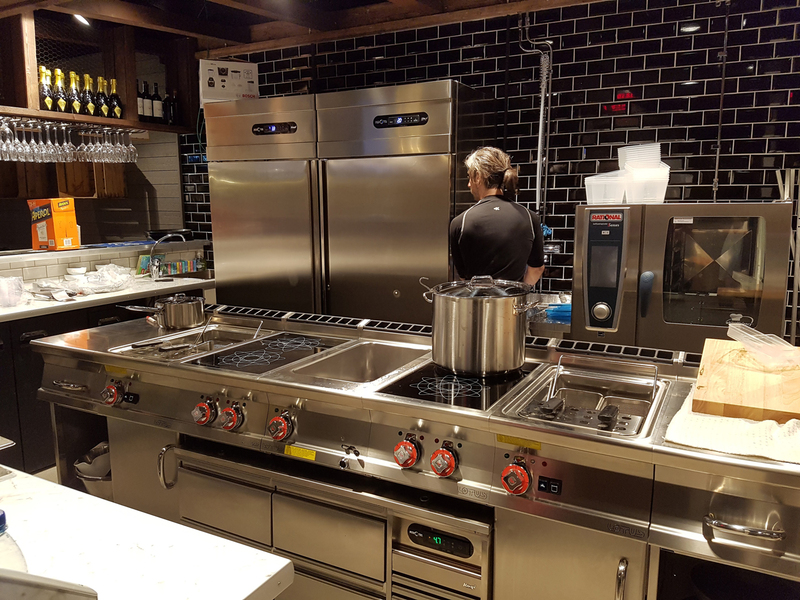 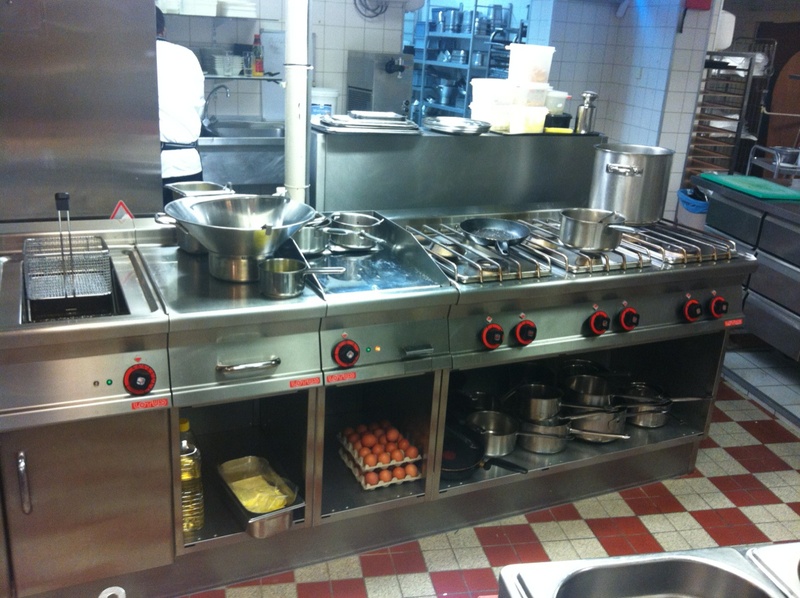 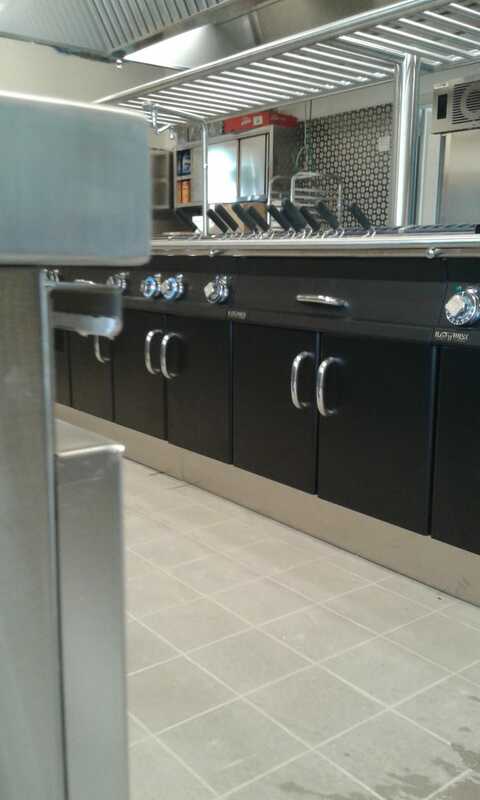 Over the years, LOTUS broadened the range of products on offer arriving at planning, producing and allocating cooking systems for all catering and restaurant settings. 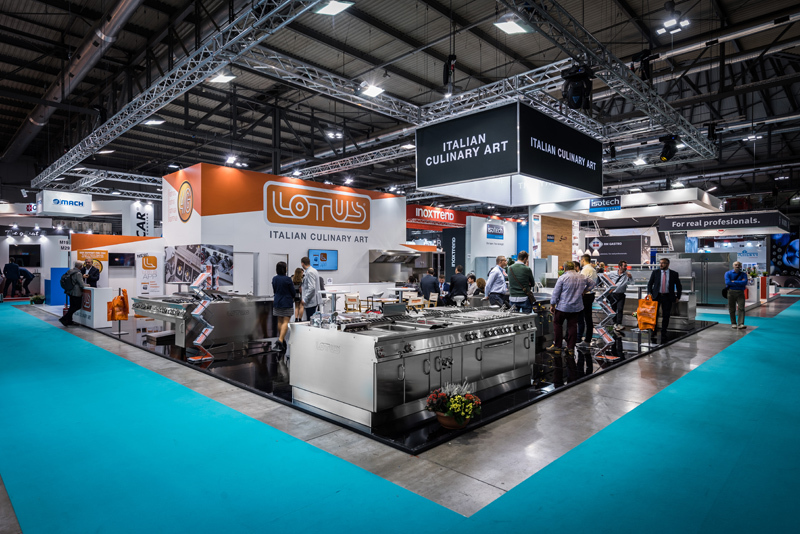 This development, intended for customers of all sizes, or business which grow and need to add to their existing cooking line efficiently and smoothly, has led LOTUS to consolidate its market share, where it has always stood out for its dynamic approach and innovative ability. 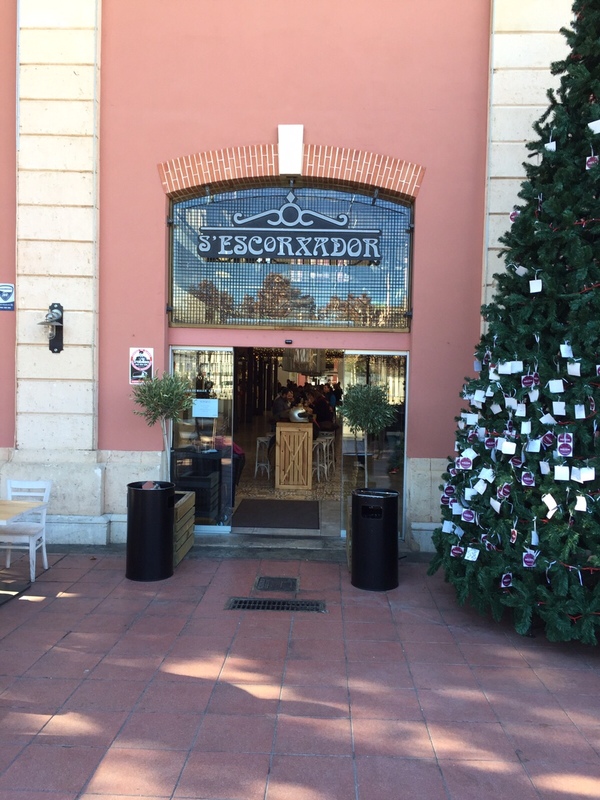 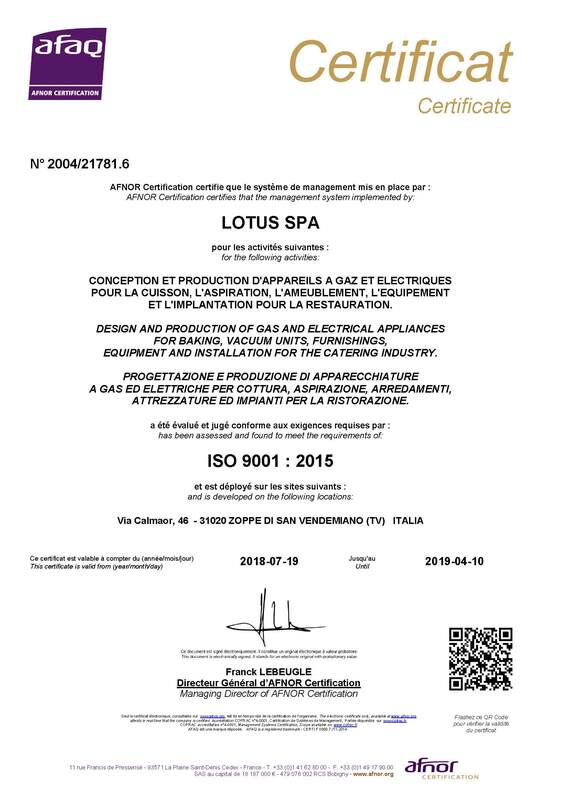 Today, LOTUS spa has an establishment of more than 8,000 square metres, and it is capable of successfully supplying and catering to the needs of over 2,000 customers distributed throughout Europe and the rest of the world, from Scandinavia to Eastern Europe, Arab Countries, North Africa, the Americas, Asia and Oceania. 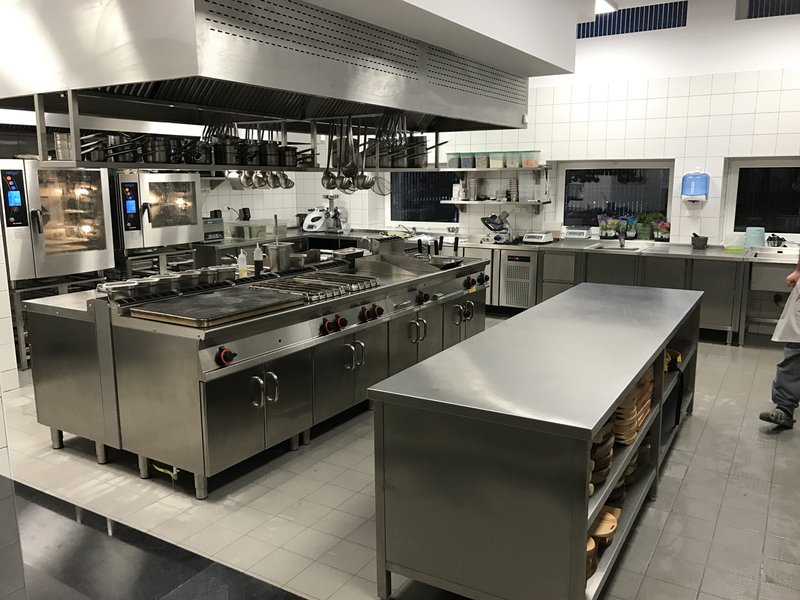 The harmonious integration of the departments is part of the success of the company: design, production, quality check, administrative and after sales departments operate altogether to reach the same objective: the excellence. 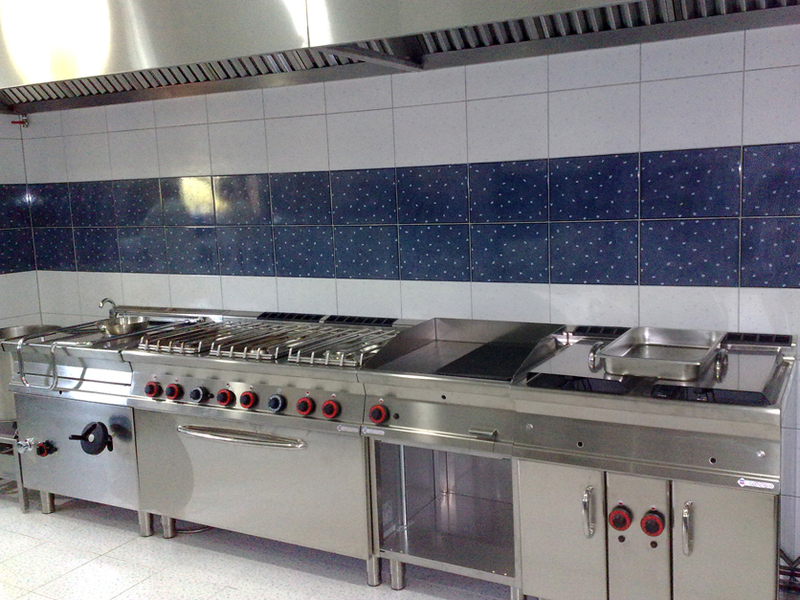 This guarantees an integrated working flexibility as far as the share of responsibilities is concerned. 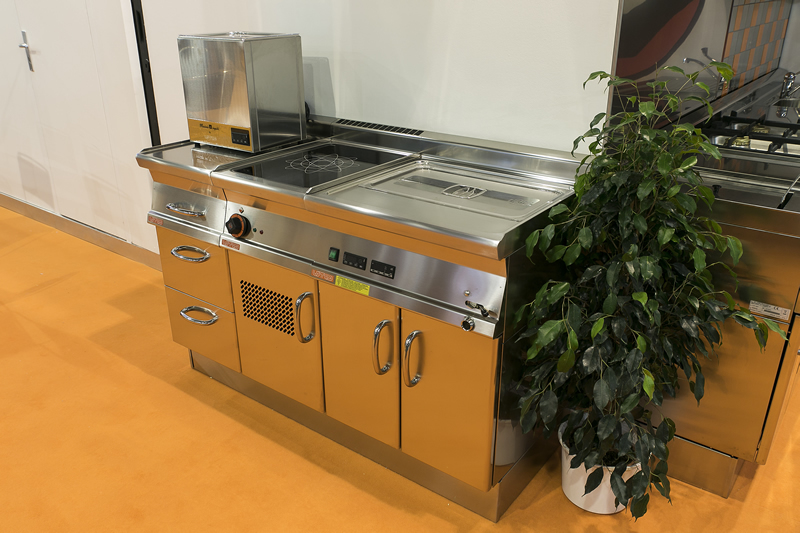 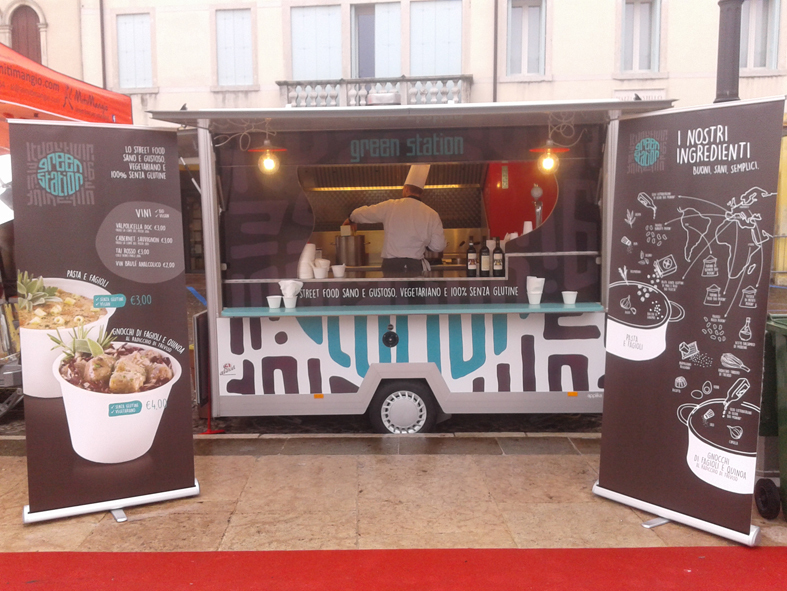 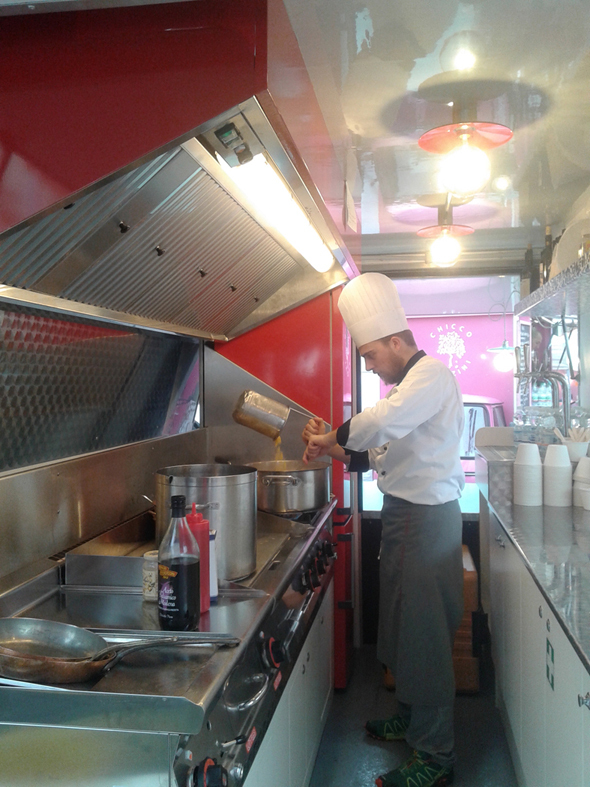 And this is what has made it possible to guarantee the degree of flexibility thanks to which LOTUS can offer its customers such a wide range that is truly unrivalled: 6 series of cooking lines and many other lines of equipment, each intended for the fast food, snack bar and large-scale catering sectors. 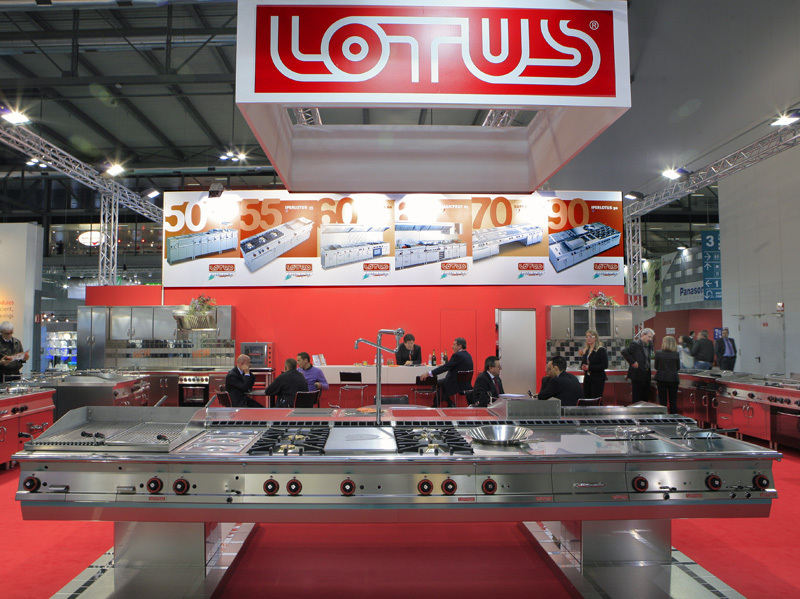 Skill and technology epitomise the path taken by LOTUS products throughout the manufacturing process. 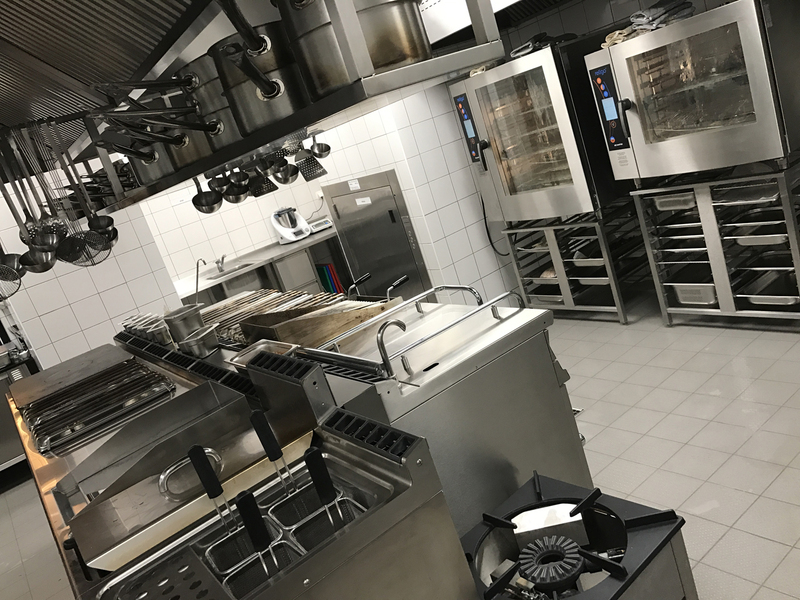 Starting with the initial stages, such as the study of expectations in research, prototyping, planning, designing, testing and production programming. 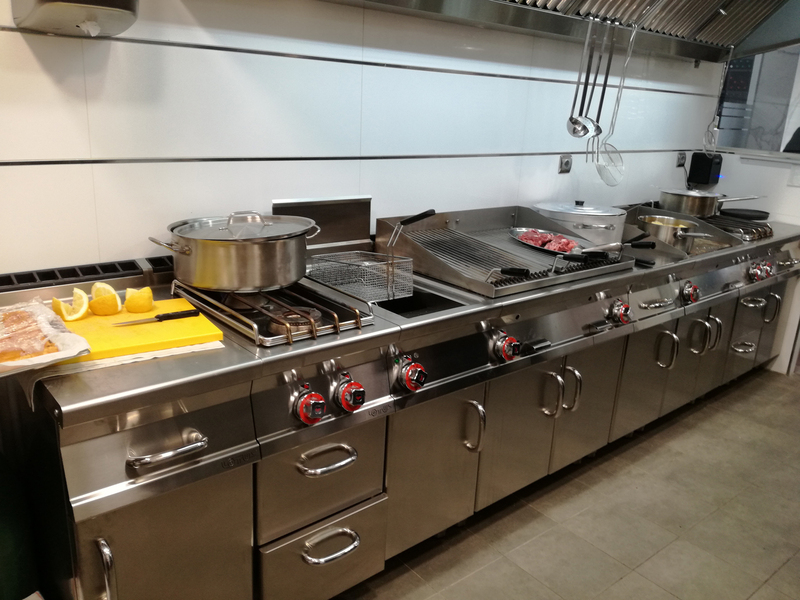 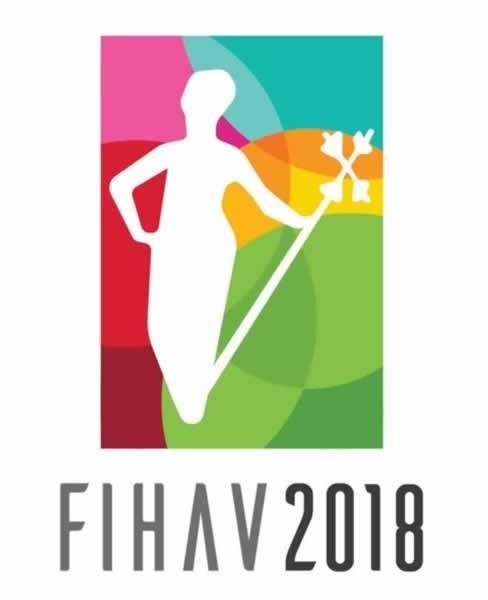 Through accurate product planning and designing, professional and styling requirements are translated into current concepts: ergonomic and functional solutions, with the distinguishing traits of solid design. 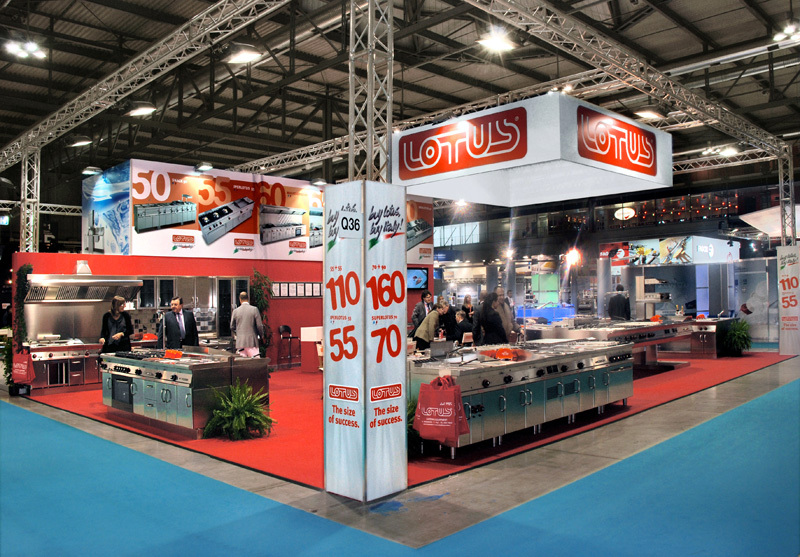 Lotus planning allows to manage times and methods, to coordinate the flows of materials and components and to organize well articulated processes that, through the examination of the expectations pointed out by the ongoing research and the understanding of the customers’ needs, build up a virtuous system that involves all the stages of the production, including the design, the prototyping and the trial. 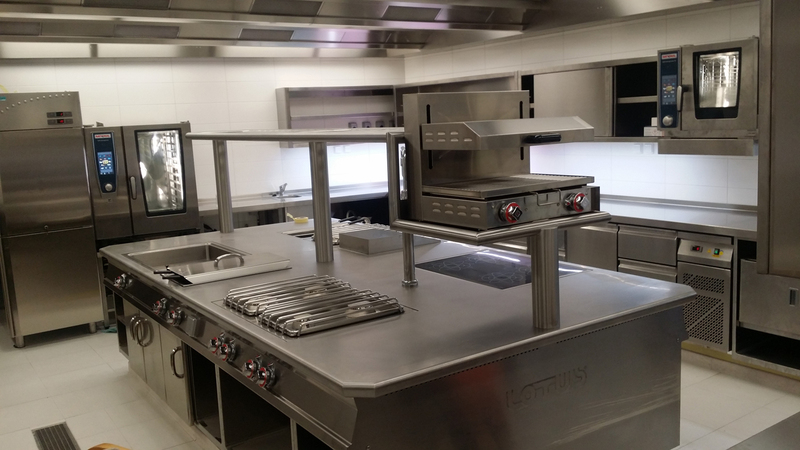 As a consequence, this system ensure a high level of quality to the LOTUS finished product. 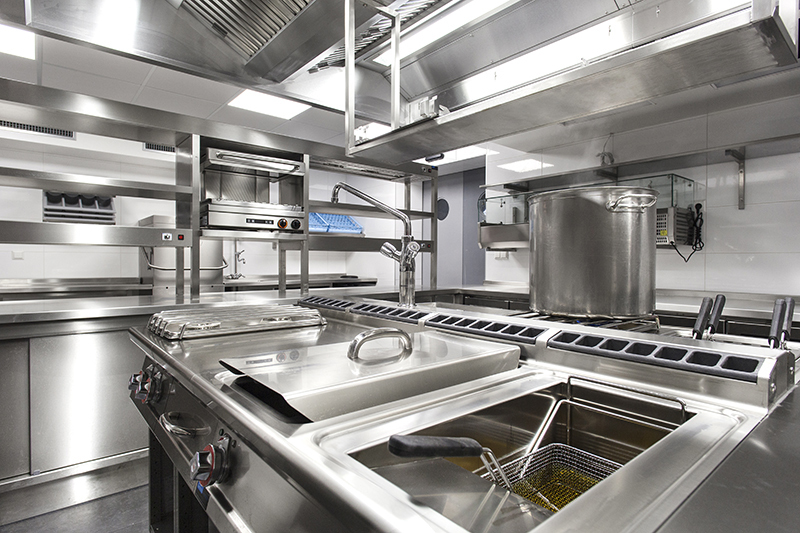 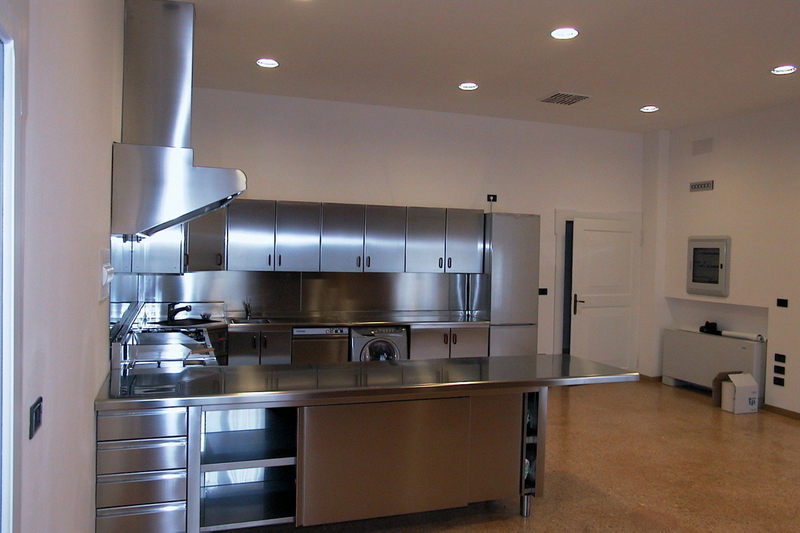 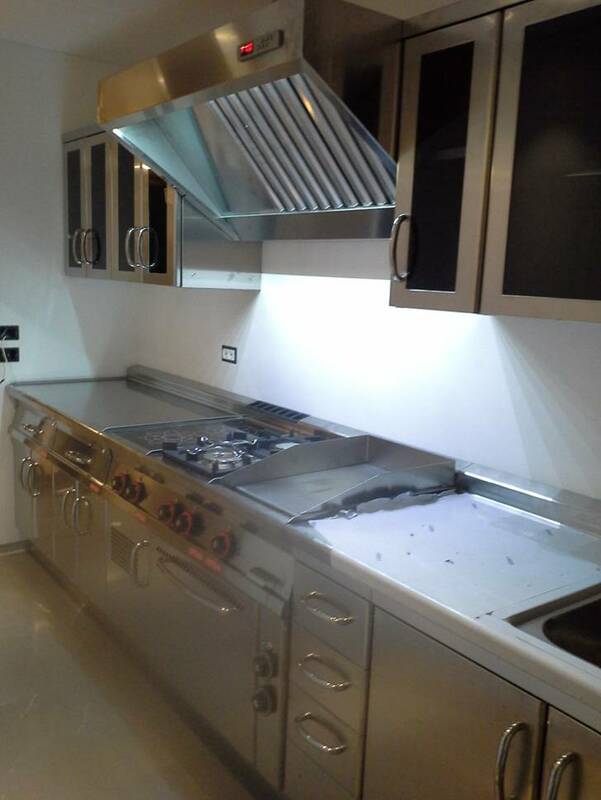 The accurate choice of materials and components is at the basis of the production process: LOTUS mostly manufactures using AISI 304 stainless steel, with a scotch brite satin finish. 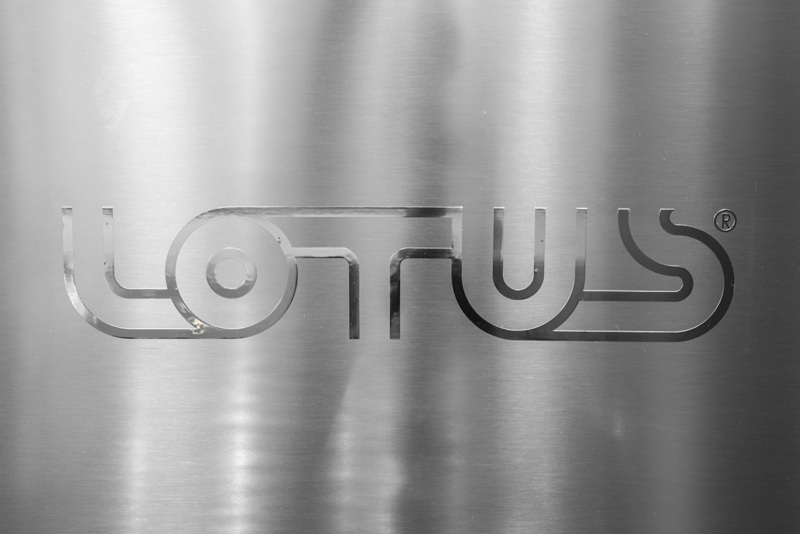 Expertise and technology accompany each Lotus model in every stage of the production. 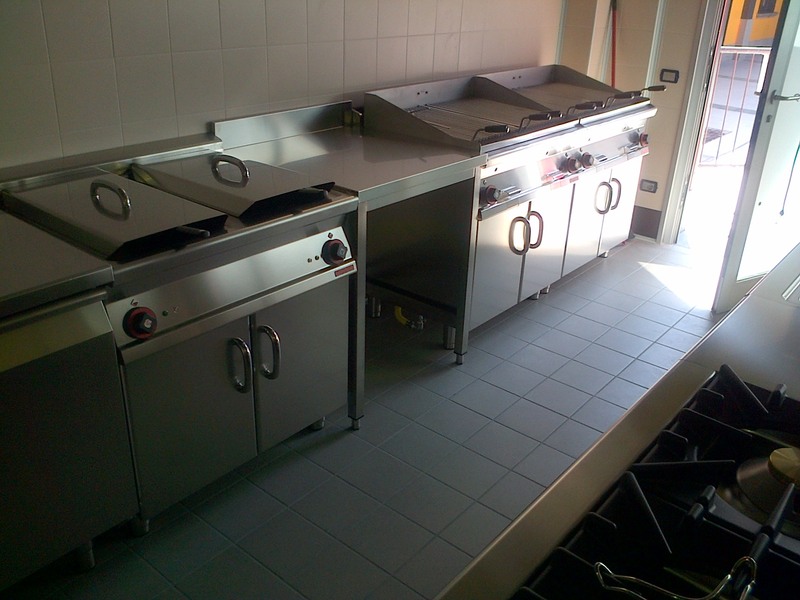 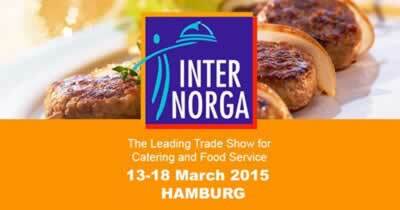 In fact the company looks after all the aspects, including design, engineering, ergonomics and reliability. 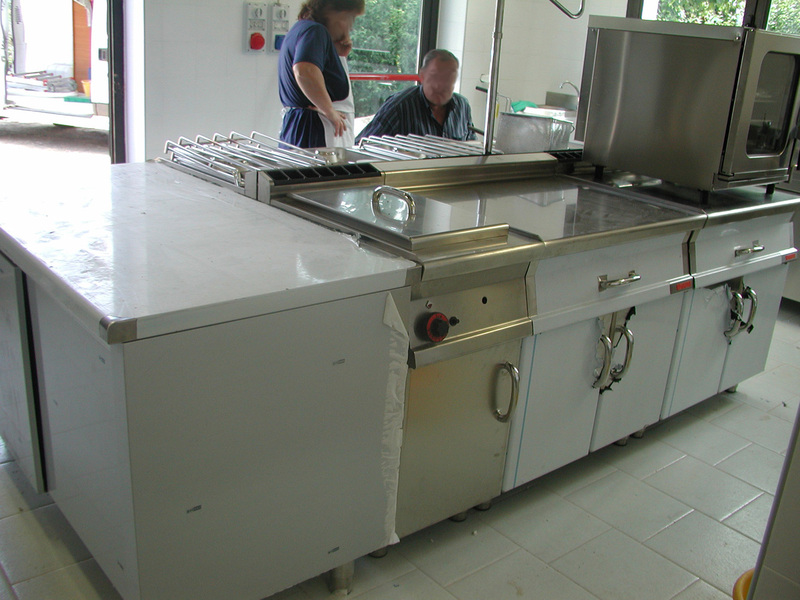 The first stage of the processing cycle is the cutting of the metal sheets that are then accurately trimmed. 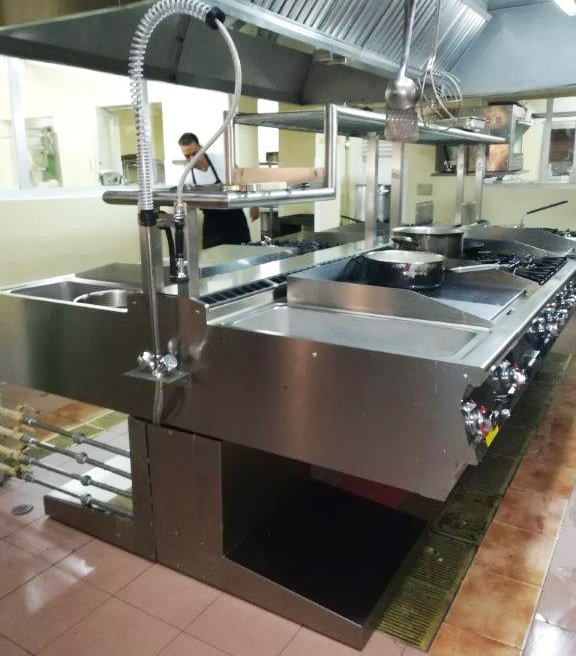 The central production stage is bending, which is performed using the most advanced numerically controlled machines to maintain high precision standards. 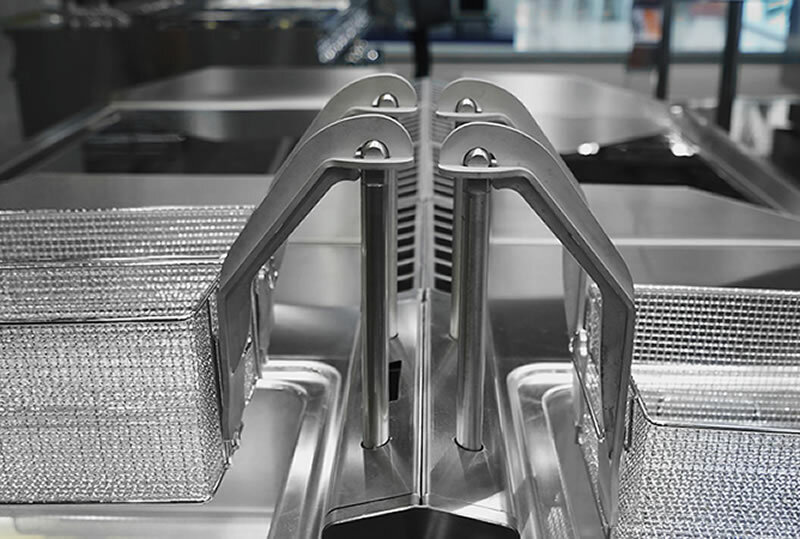 The most delicate operations, like certain types of welding, are always performed by specialised engineers, assisted by robotised systems, and a leak test performed using a Wood's lamp. 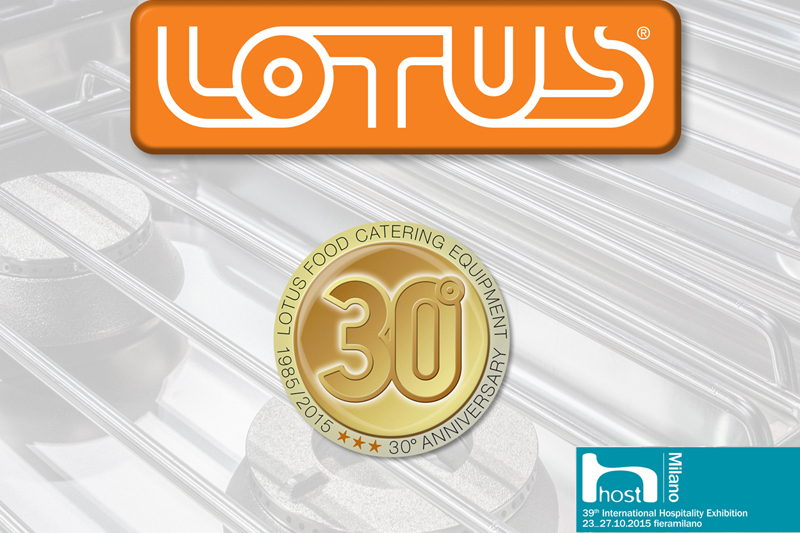 Their accurate execution is in fact a guarantee of leak tightness, durability and reliability of LOTUS products. 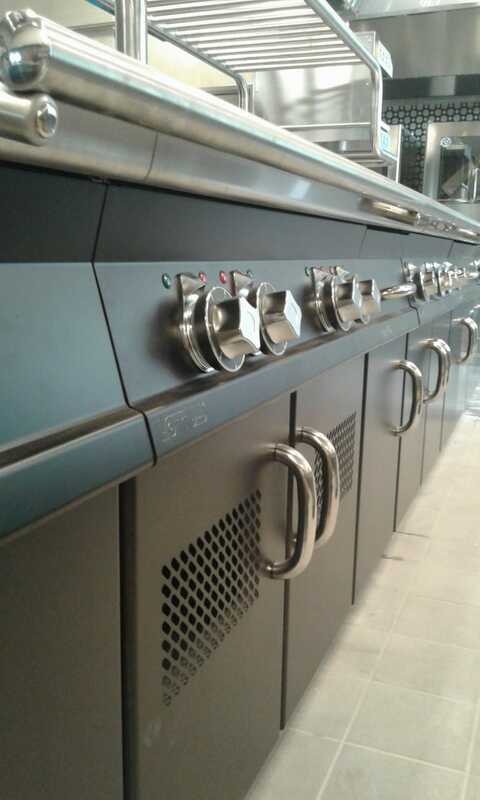 Once parts and components are realized, they are sent to the assembly department and finally put together. 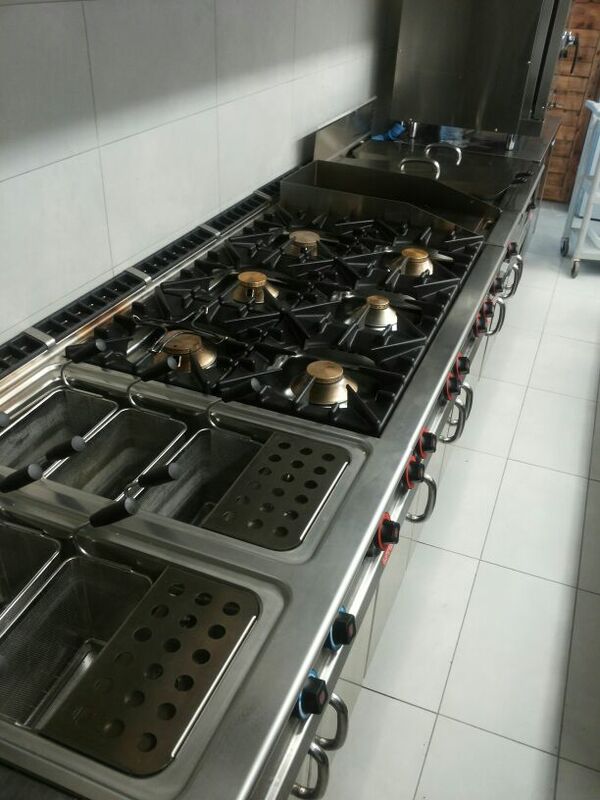 Only after having passed the final tests and the inspection, the products are packed and finally prepared for the shipment. 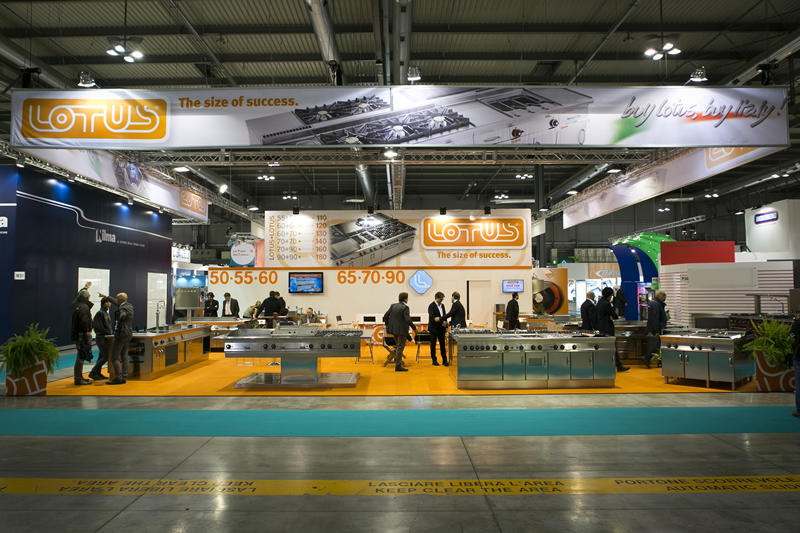 Programming and organisation are the reasons behind the success of LOTUS on the world market. 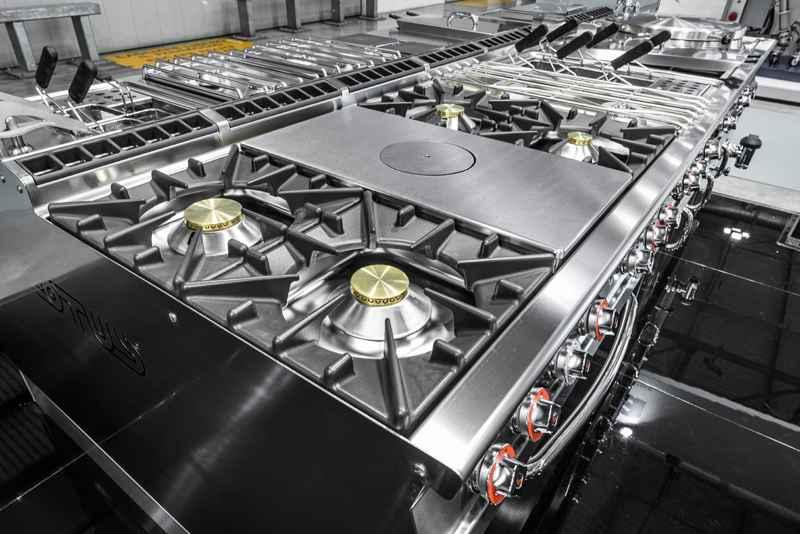 Today, in fact, over 50% of its products are shipped abroad. 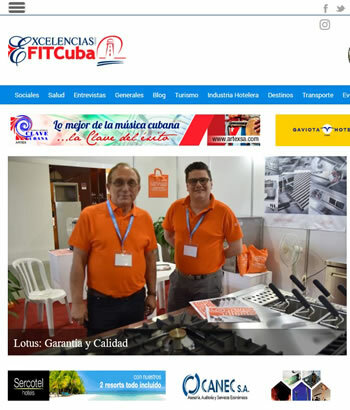 Such results are the outcome of an ongoing improvement process that involves both the management and the staff in order to guarantee to the customers worldwide an effective pre- and after-sales service. 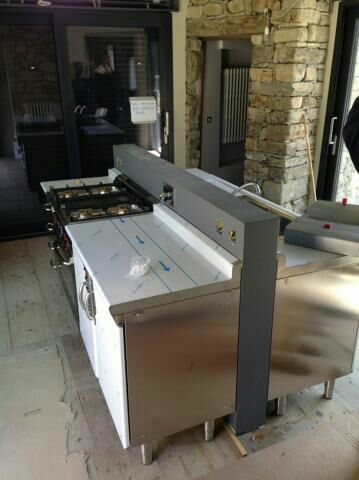 On one hand, the pre-sales service identifies a tailor made project based on the needs of the customer. 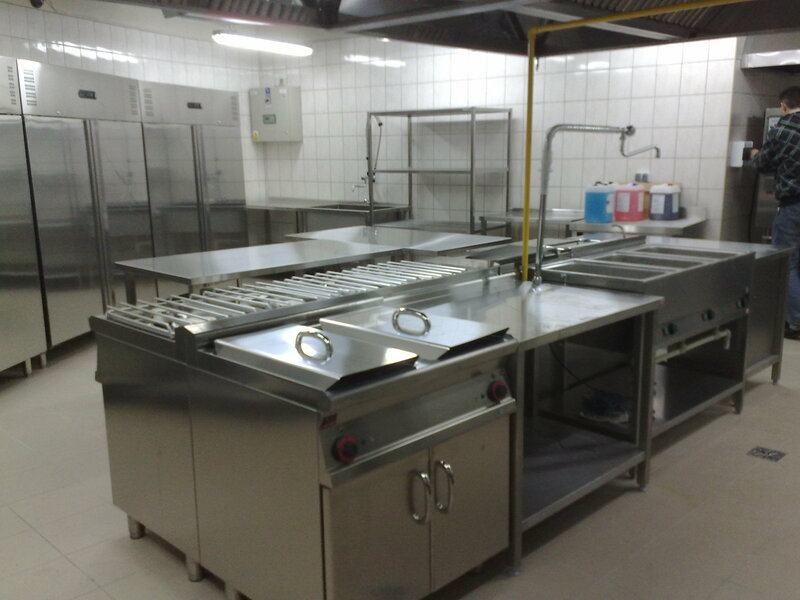 On the other hand, instead, the after-sales service is organized to supply spare parts as quickly as possible. 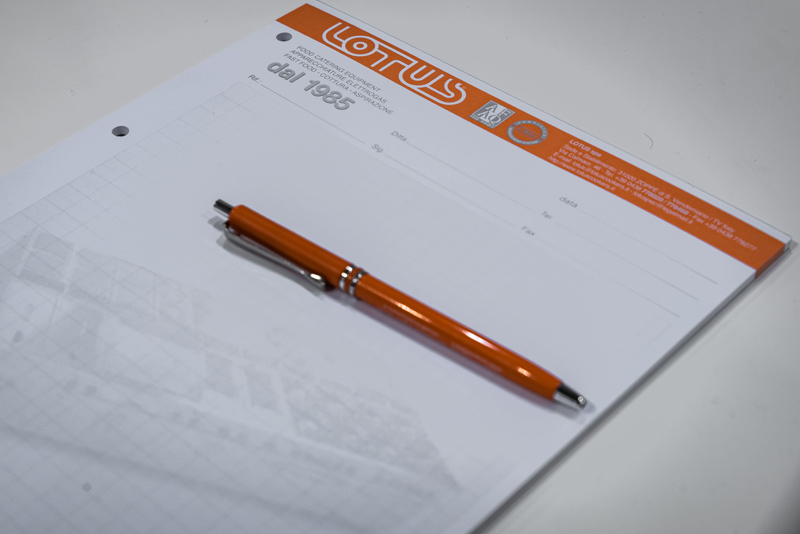 All this to ensure the technical and technological quality that is the concrete essence of the LOTUS product of today and the future. 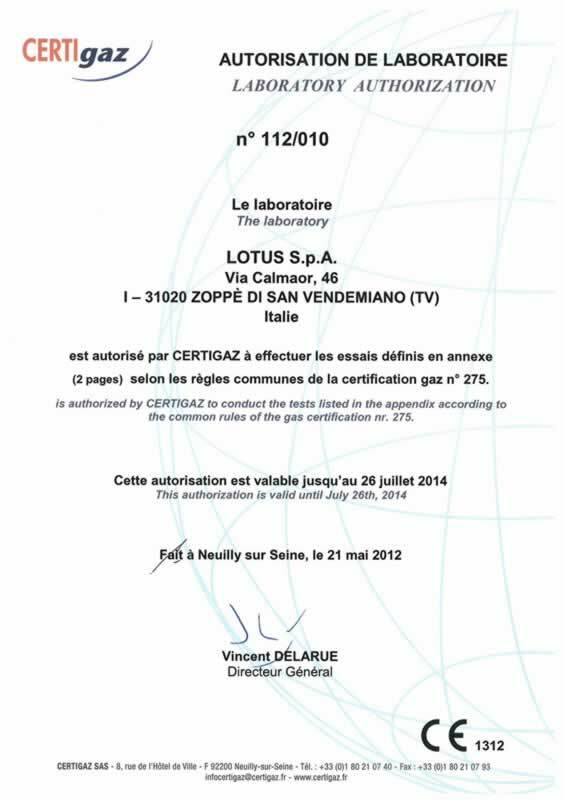 LOTUS is one of the first Italian companies in this sector to obtain CE certification, synonymous of absolute production quality and full compliance with the requirements for operational safety and reliability, sturdiness and durability of products. 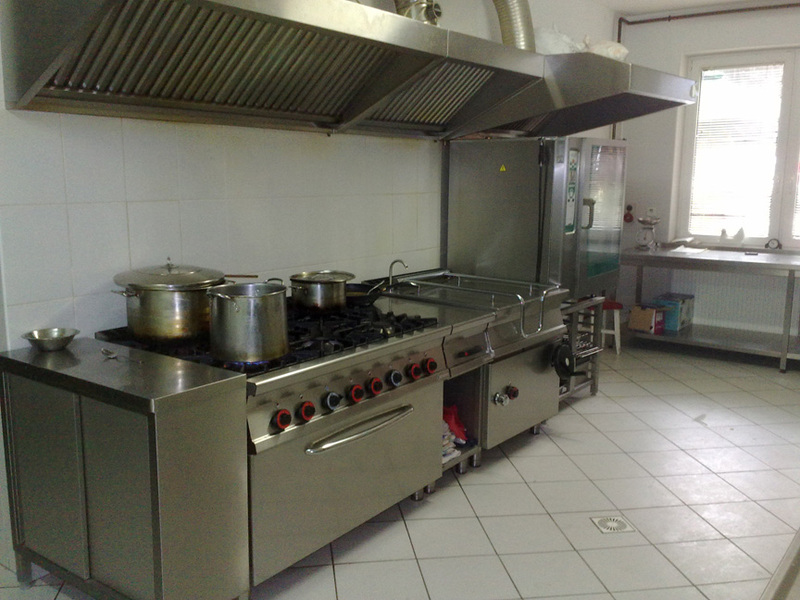 These requirements have also been confirmed by a UNI EN ISO 9001:2015 certified company system (AFAQ certifying body). 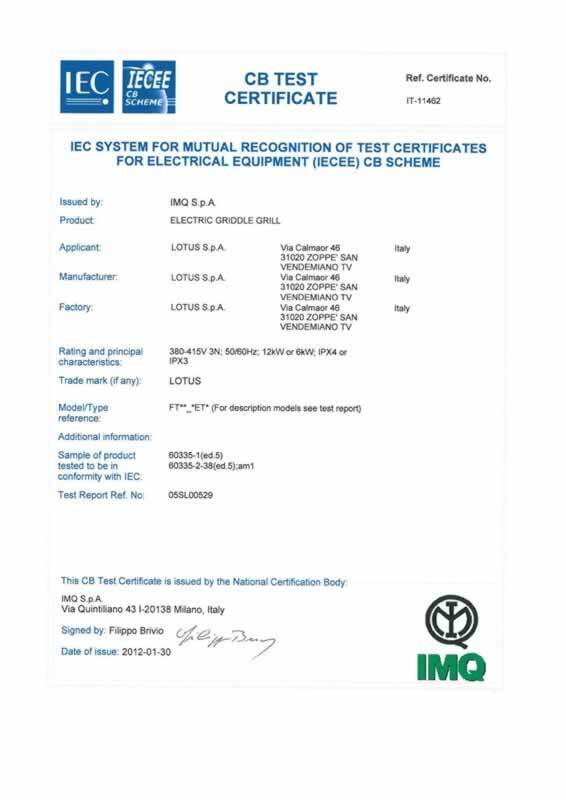 Furthermore, since 2002, LOTUS has its own in-house certified laboratory, authorised to perform the necessary tests for the CE marking of its products. 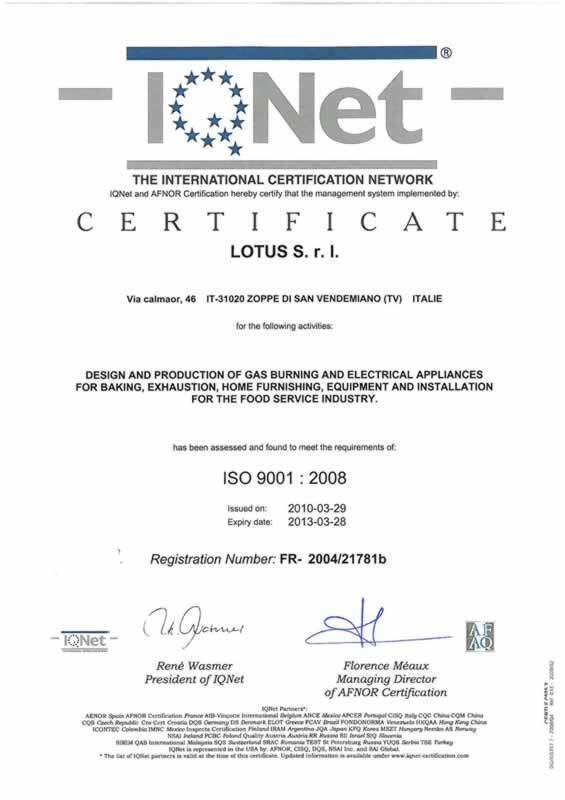 The spirit of applied research and the maintenance of a high level of awareness of the quality at every level foster the ongoing technology innovation and the improvement of the LOTUS product in terms of effectiveness and reliability. 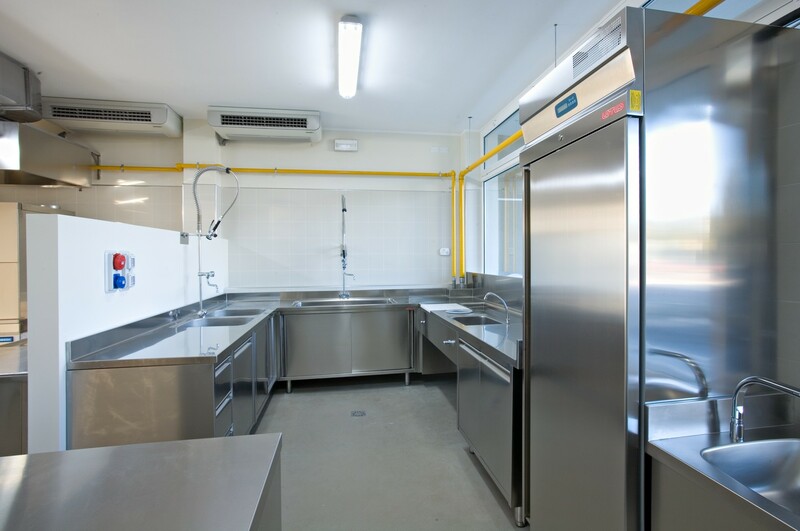 In this laboratory, the equipment undergoes regular and in-depth checks and solutions are experimented with, with a view to providing innovative solutions to today's requirements. 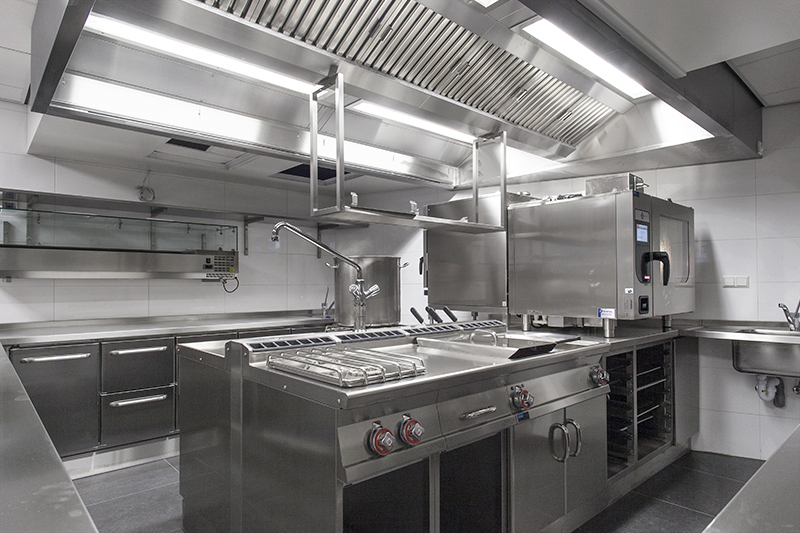 That technical and technological quality which has always been our strength is pursued right here. 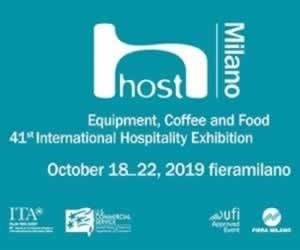 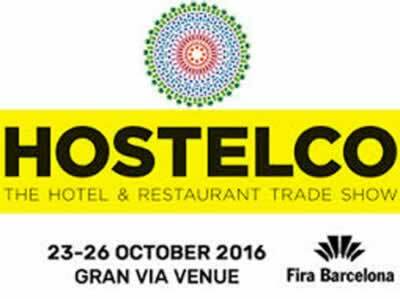 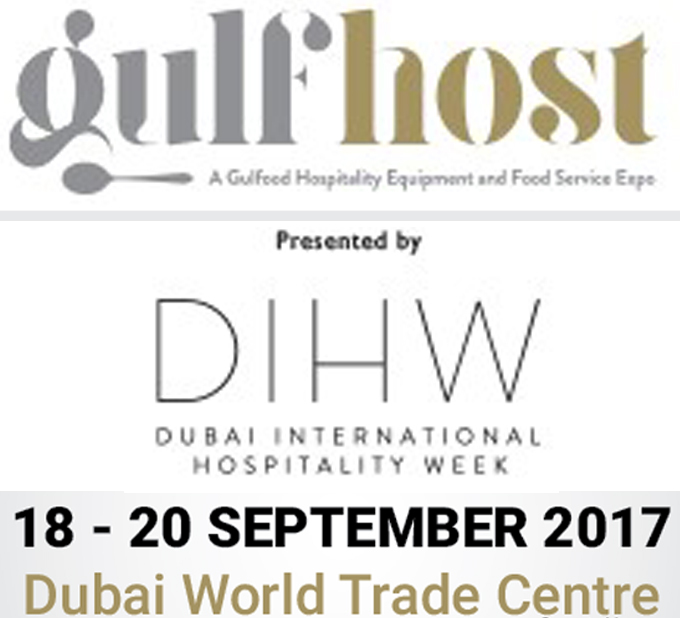 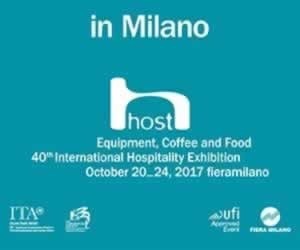 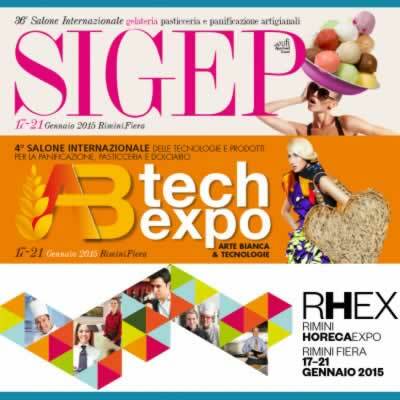 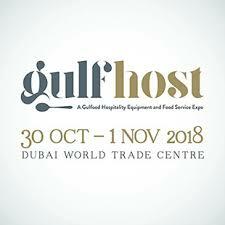 Pad.3 - Stand D460 with MAINHO "MAQUINARIA INDUSTRIAL HOSTELERA"
with pleasure we inform you that Lotus, to make better the service towards the sale service, introduce, beginning from the 24th October 2014, a new service for the spare parts management. 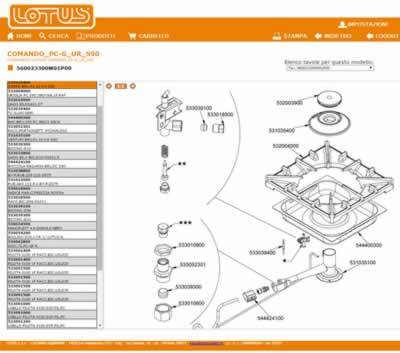 From this date will be assets a “plate-form web” dedicated http://spares.lotuscookers.it where, making a free registration, will be possible enter into the exploded views and price list of exploded views area updated in real time. 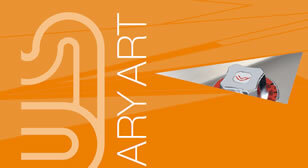 There will be possible send the purchase orders directly to this site too. 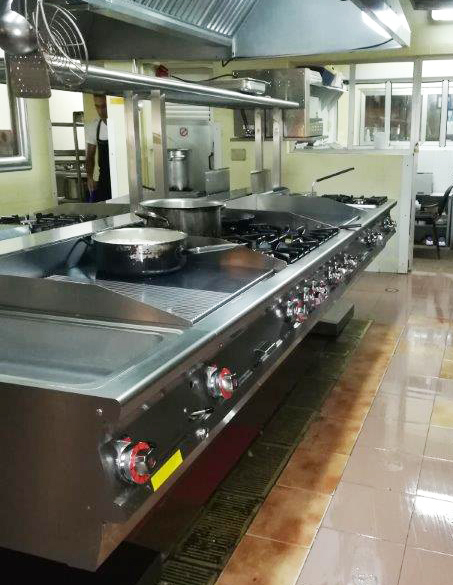 We hope that it will allow a greater speed and quality on the service. 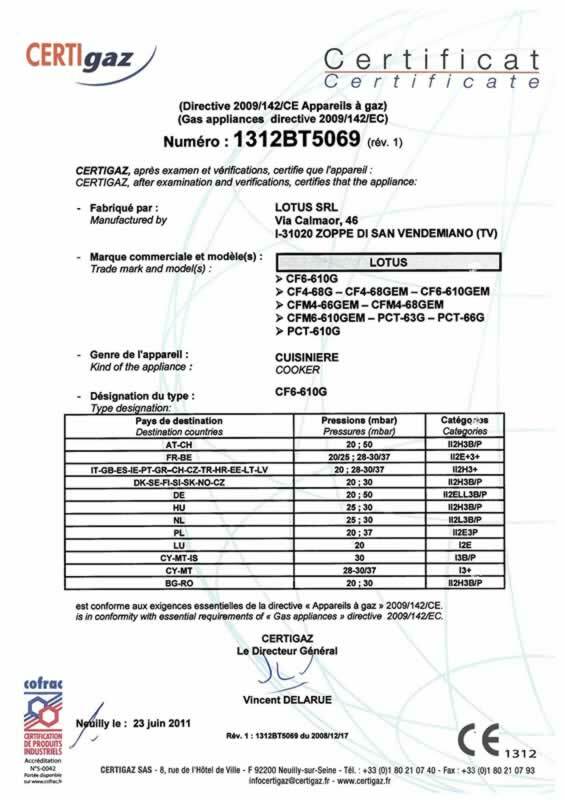 In this section are collected books, videos and all the technical specifications of the products LOTUS, in accordance with the European certifications. 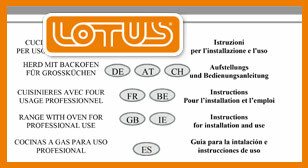 Contact send an email to lotus@lotuscookers.it , or fill out the form below. 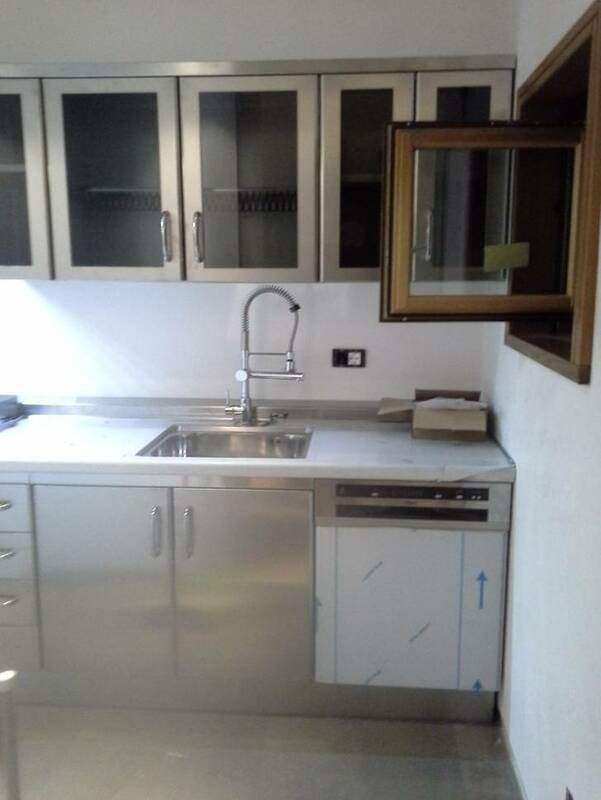 Alternatively you can contact the referent of the competent office. 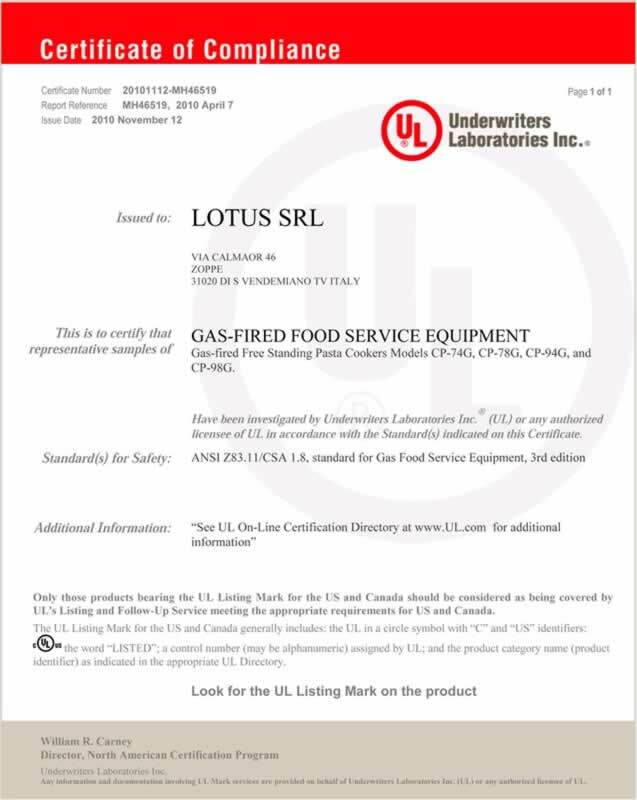 Lotus S.p.A. in order to be able to respond to any requests for technical documentation and / or product requests authorization to the registration of personal data and identifying useful purpose. 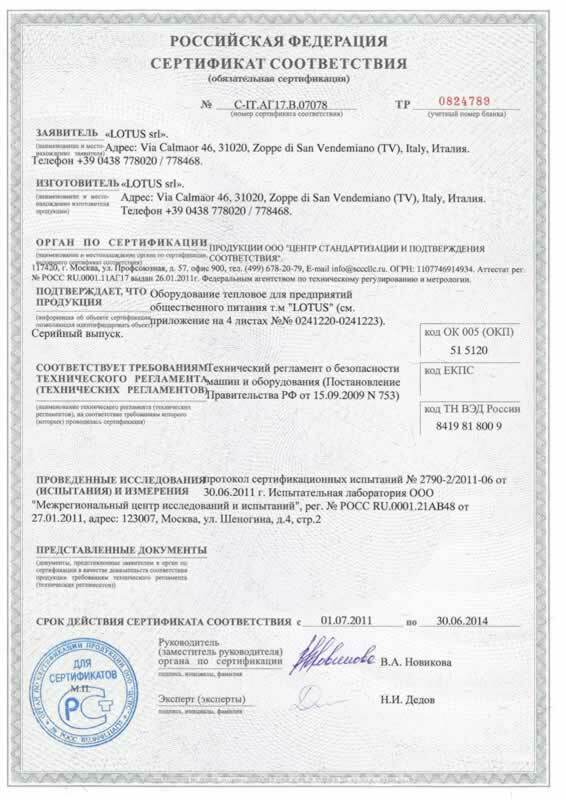 Therefore, please sign the following declaration: I declare that I am aware of the law 196/03 on the protection of personal data and, pursuant thereto, to accept and authorize the use of my data submitted. 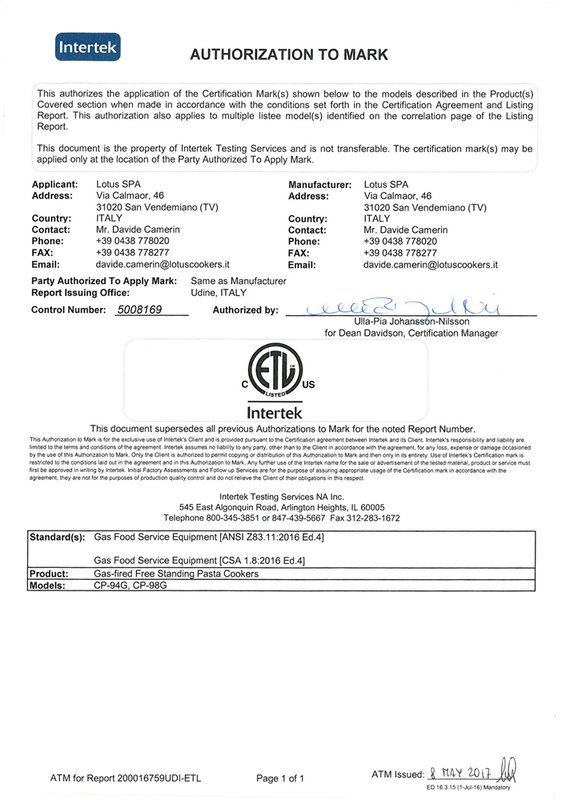 Recall that, in order to end the recording, & egrave; necessary to consent to the requested data. 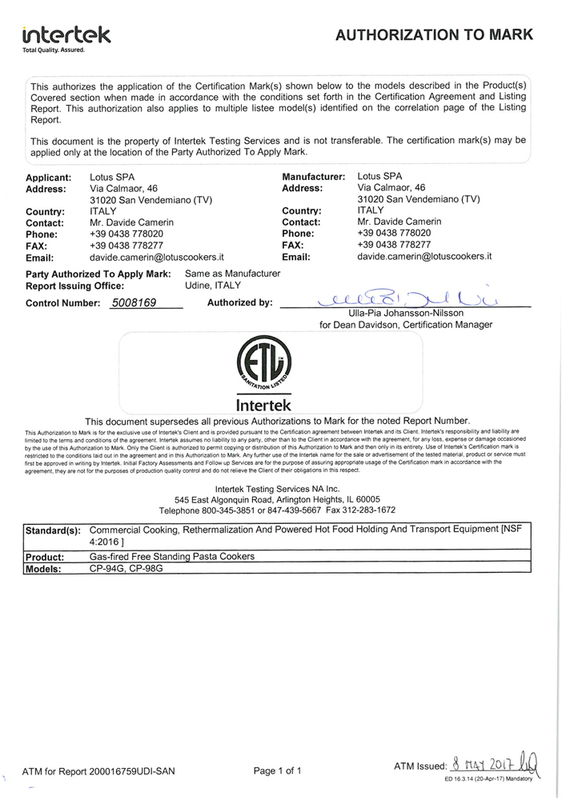 The identifying information you provide may be used for the communication of commercial information regarding new products and services of Lotus Spa and / or Society & agrave; with which the same has to be in trade agreements, and to verify the level of customer satisfaction on products and services. 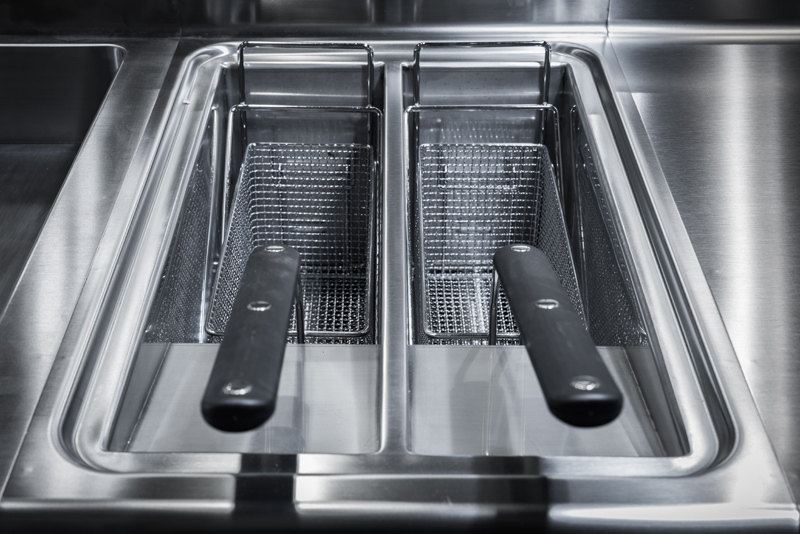 The consent to the processing of your data for this purpose & egrave; entirely optional. 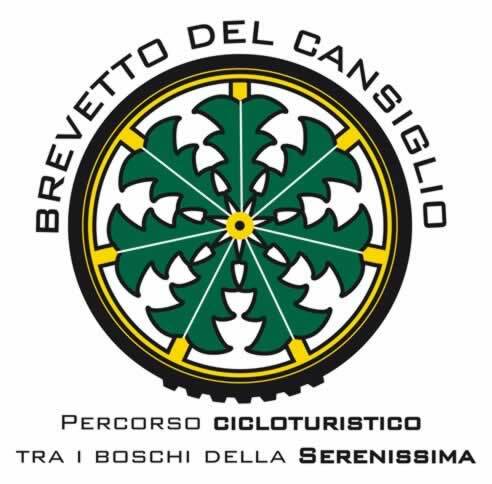 Situated in the province of Treviso, in what is commonly referred to as Inox Valley, in Zoppè di San Vendemiano, LOTUS spa is easy and convenient to get to (Marco Polo Venice and Canova Treviso airports, A27 motorway): just 2 km from the Conegliano Veneto exit and 60 km from Venice.